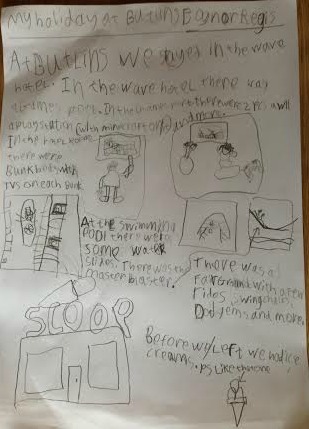 Following on from Owl’s post last week, this is Monkey’s review of our Butlins break. At Butlins we stayed in the Wave Hotel. In the Wave Hotel there was a Games Port. In the Games Port, there were 2 PCs, a Wii, a Playstation (with Minecraft on it) and more. In the hotel room there were bunk beds with TVs on each bunk. At the swimming pool there were some water slides. There was the Master Blaster. There was a fairground with a few rides, swing chairs, dodgems and more. Before we left we had ice creams. 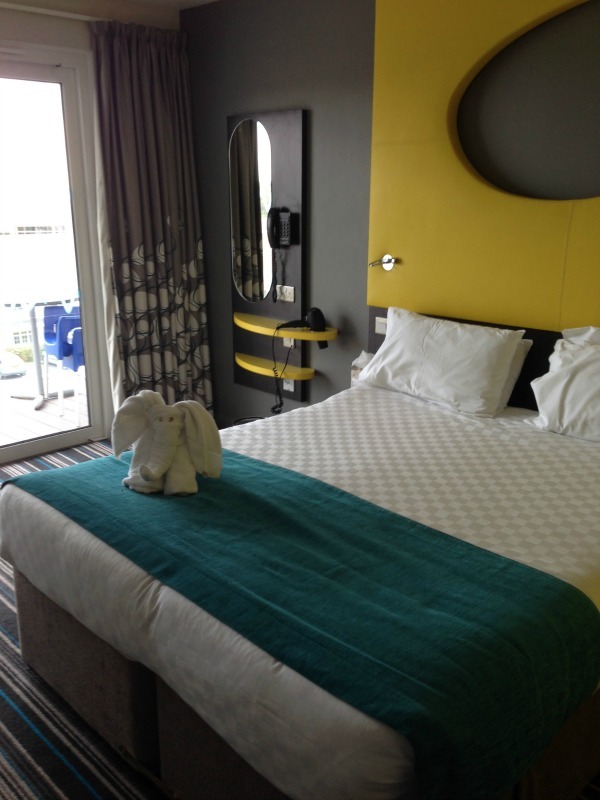 We were invited to stay on a 4 night break at Butlins Bognor Regis as part of our role as Butlins Ambassadors. All opinions are our own. 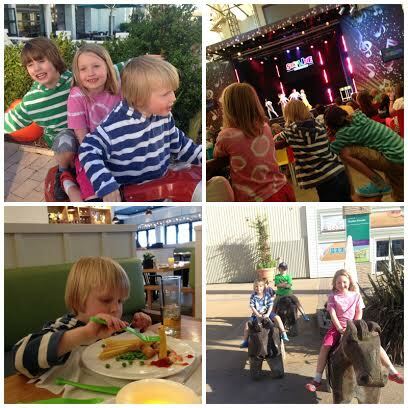 This entry was posted in Butlins, Holidays and tagged butlins, Butlins Ambassadors on July 9, 2014 by Hannah. 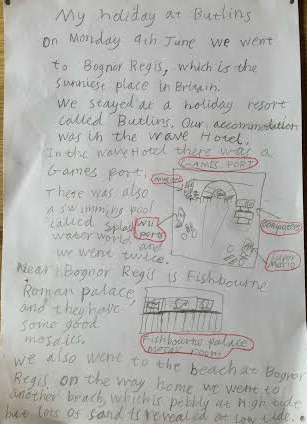 I have already written here about our break at Butlins Bognor Regis, and so has Paul, so I thought it would be good to give the children a turn. This is Owl’s review. 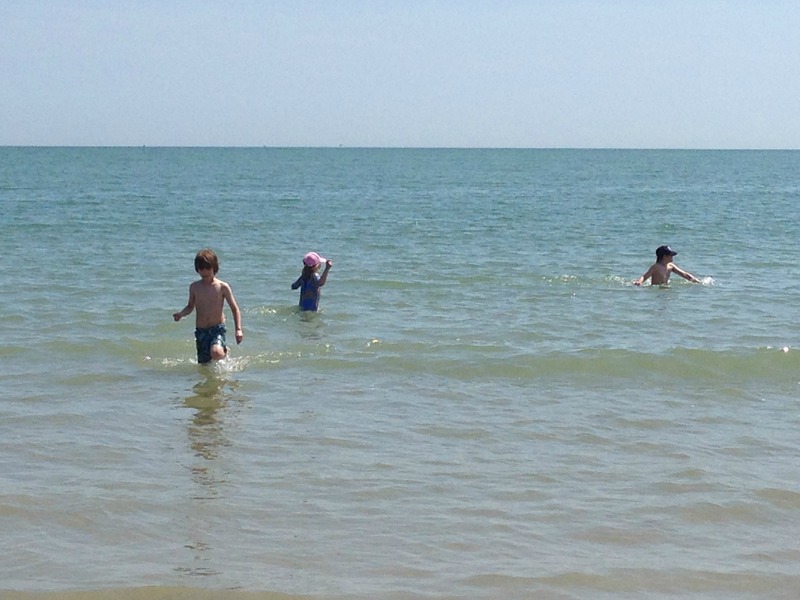 On Monday 9th June we went to Bognor Regis, which is the sunniest place in Britain. 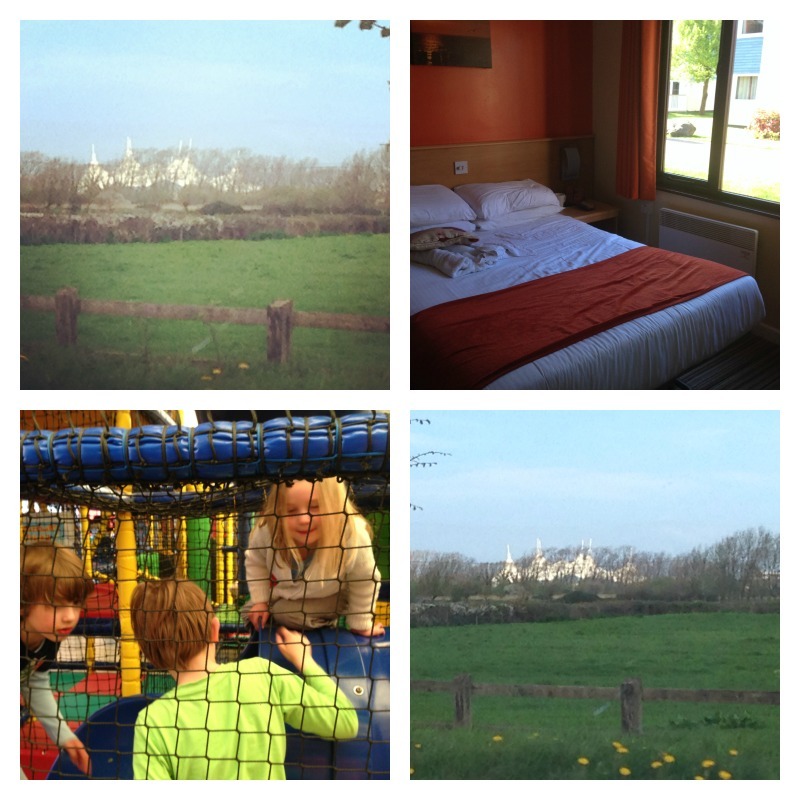 We stayed at a holiday resort called Butlins. Our accommodation was in the Wave Hotel. In the Wave Hotel there was a Games Port. There was also a swimming pool called Splash Water World and we went twice. Near Bognor Regis is Fishbourne Roman Palace, and they have some good mosaics. 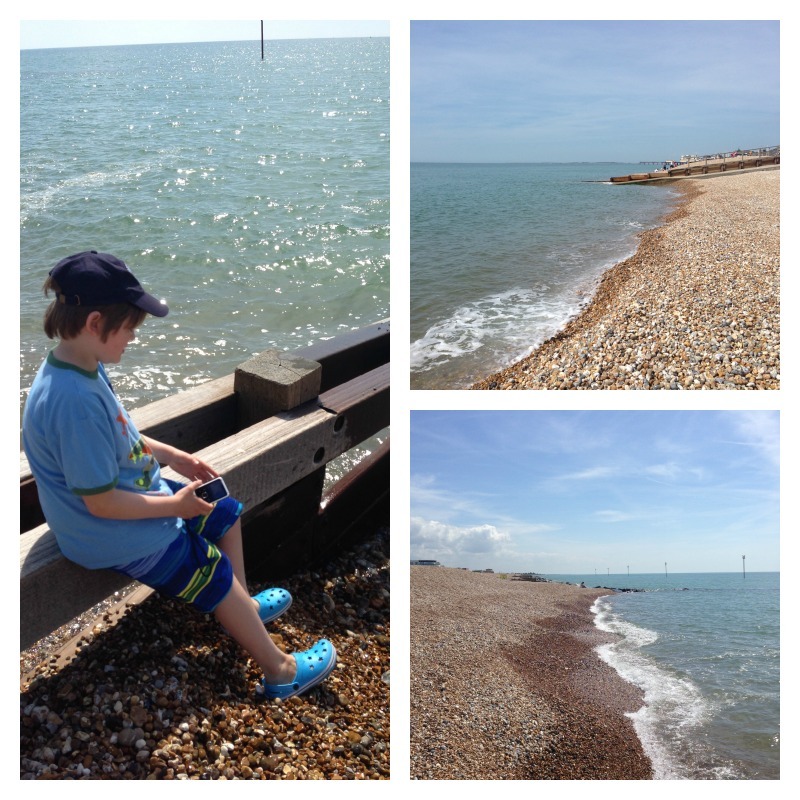 We also went to the beach at Bognor Regis. On the way home we went to another beach, which is pebbly at high tide but lots of sand is revealed at low tide. Look out for Monkey’s review coming soon! 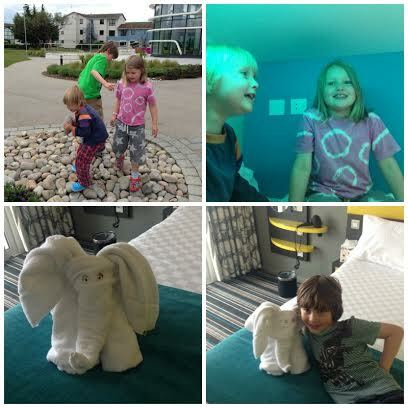 This entry was posted in Butlins, Holidays and tagged butlins, Butlins Ambassadors on July 1, 2014 by Hannah. 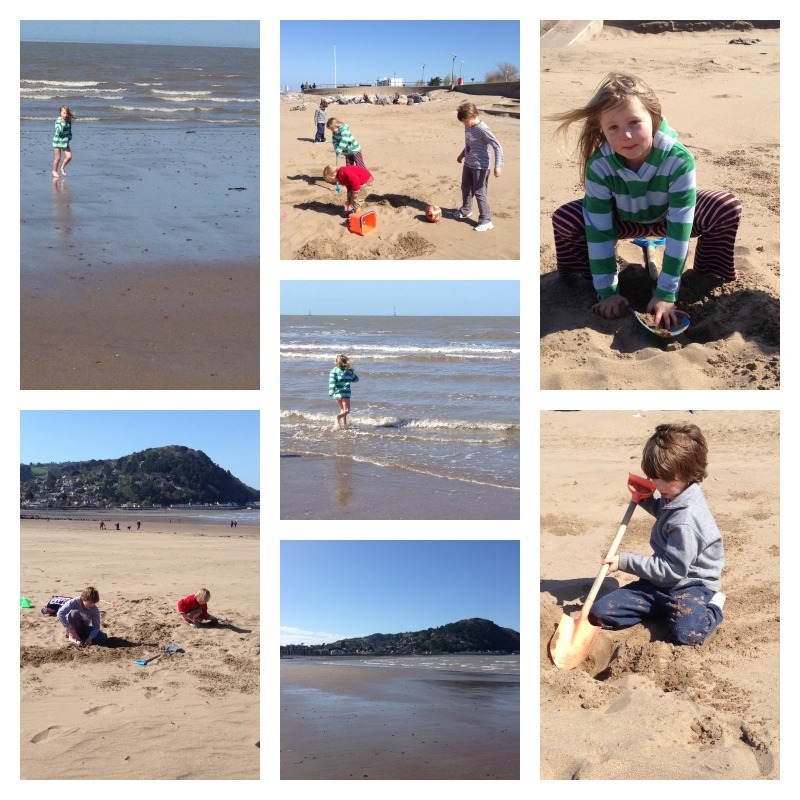 Butlins, Butlins, Butlins – a great time by the sea! I used to read positive holiday reviews in paper and think “they must be positive as the reviewer got a cheap deal to go there”. Then last year Hannah got appointed as a Butlins Ambassador, and once I’d stopped cracking lame jokes (are they going to give us red Ferrero Rocher? Where are the Butlins Consulates etc etc) we chose Butlins Bognor Regis as our review destination. And now we’ve just come back, I realise that, for a reviewer to give a positive review, the holiday has to be good enough to overcome the natural English traits of negativity and criticism. And Butlins was good. Really good. Our kids didn’t want to come home. We all laughed. Yes, yes lots of hotels do towel animals but the Butlins masterstroke was to provide an instruction booklet on how to make the elephant. It’s a step up from the towel roast chicken my mum showed us how to make in Minehead one evening. We had a slightly unfortunate test of the accommodation – our daughter came down with Tonsilitis, so she stayed in bed for much of the last two days. There are a lot worse places to be ill – I pointed out to her if she were ill at home she wouldn’t have a TV on the wall and a view of the sea out of the window. We took it in turns to look after her, and I have to admit I rather enjoyed my stints of sitting on the balcony reading the paper in between administering antibiotics. On to the food. We had a half board package in The Deck restaurant, which was a breakfast and dinner buffet with the option to swap the dinner buffet for vouchers to use in other Butlins restaurants. We didn’t have a bad meal the whole time we were there, and even the standard of the breakfast buffet was excellent. I travel all over the country on business, and have used a lot of Full English and Continental breakfast buffets, but never one that included pancakes, kippers, made-to-order omelettes and porridge. The temptation was to eat too much, and of course we succumbed to this, particularly on the first morning. But with a long enough holiday I think we could manage to get back to normal eating levels. 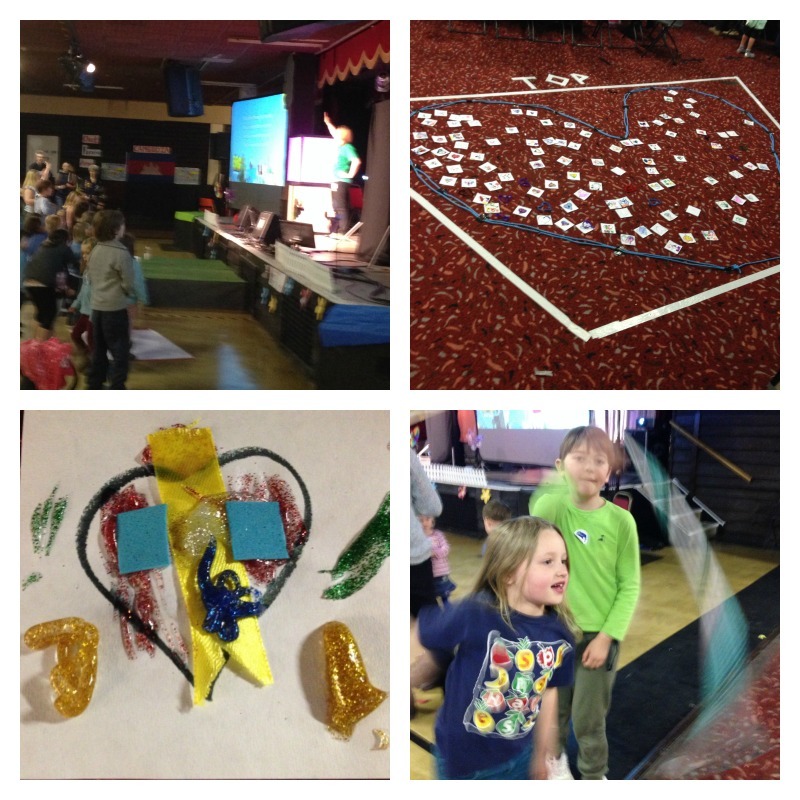 We were keen to see what Butlins provided for the children, as when we’ve stayed at Butlins Minehead it’s been as part of Spring Harvest, with its own children’s programme. The first thing Butlins provided for our children was a dedicated Games Port containing Playstations, Wiis and other consoles. Telling an eight or ten year old that they can play whatever they want, including Minecraft, is a holiday winner. Our older boys spent at least an hour there each day , and the younger ones joined in from time to time. Then there were the live shows. We watched a full pantomime on the first night that was as good as the one we see in Epsom every year.. We saw the Skyline Gang show, the Mike the Knight show, the Thomas the Tank Engine show and the Puppet show – all the children liked them, even the older boys. If you’ve been nervous to take your children to the theatre, the great advantage of the Butlins shows is that the seating is informal, cabaret style. No one minds if you get up and walk about half way through. The Red Coats do their job of keeping the children amused really well. Each live show had lots of the big kids in their smart red blazers acting as the audience stokers: dancing at the front, shouting ‘he’s behind you’, clapping along – what an exhausting job! We spent most of our time on site, but went to Fishbourne Roman Palace on the second day and Littlehampton beach on the way home. Hannah’s spoken about that, but the surprise for me was how little we went off site – there was enough to keep everyone amused for much of the time. The swimming pool (Splash World) is well equipped, warm and with good slides. Minehead Butlins has bigger slides ,but not all of our children can go on them, and Bognor had a family slide that even the four year old could go down. He did. Again. And Again. And Again. He was delighted. 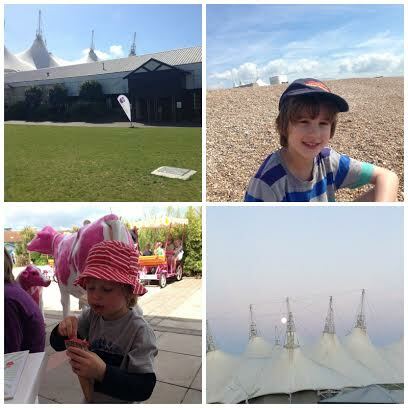 All-in-all, a great holiday and we would recommend Butlins Bognor to anyone with children. We brought granny along, and even she enjoyed it! 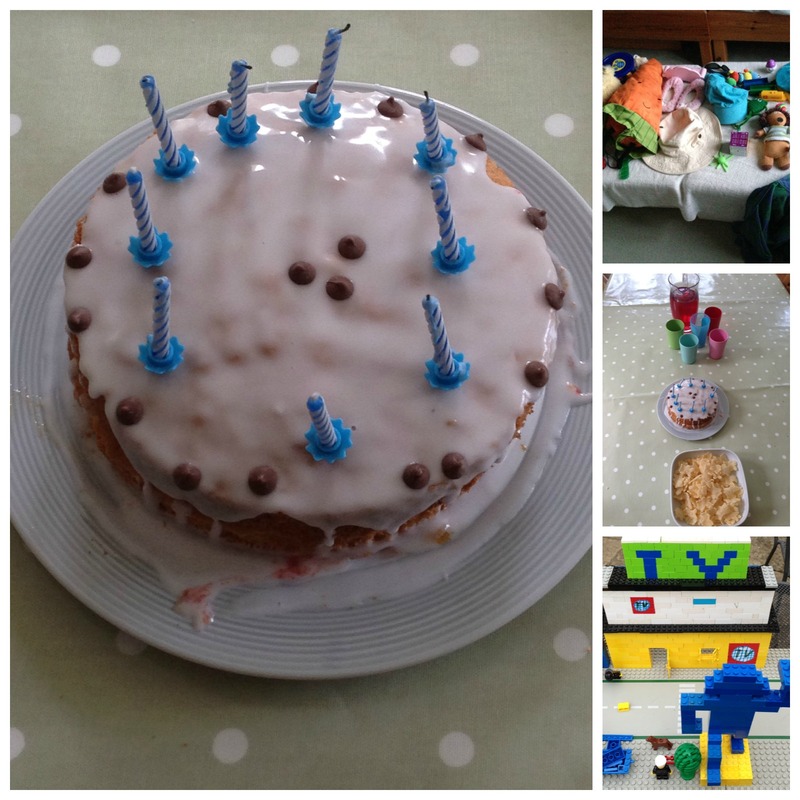 This entry was posted in Butlins, Holidays and tagged Bognor Regis, butlins, Butlins Ambassadors on June 20, 2014 by Hannah. We’ve been back from our Butlins break for a few days now, and there’s so much to write about that I’m having trouble knowing where to begin. 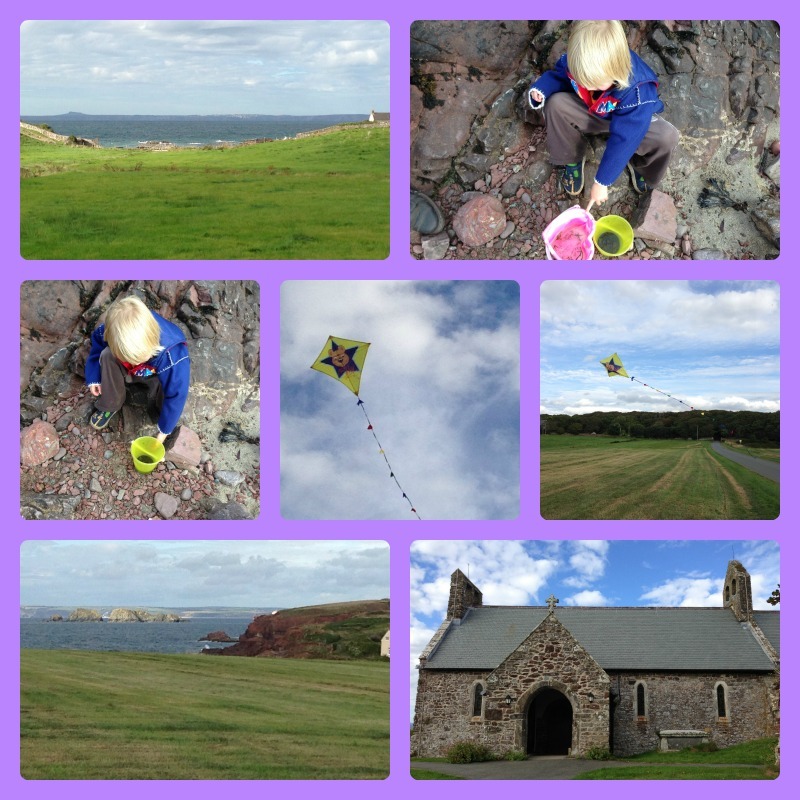 So I thought I’d start with some highlights of our holiday. The highlight of Monday was definitely checking into the beautiful Wave hotel after a tiring day. 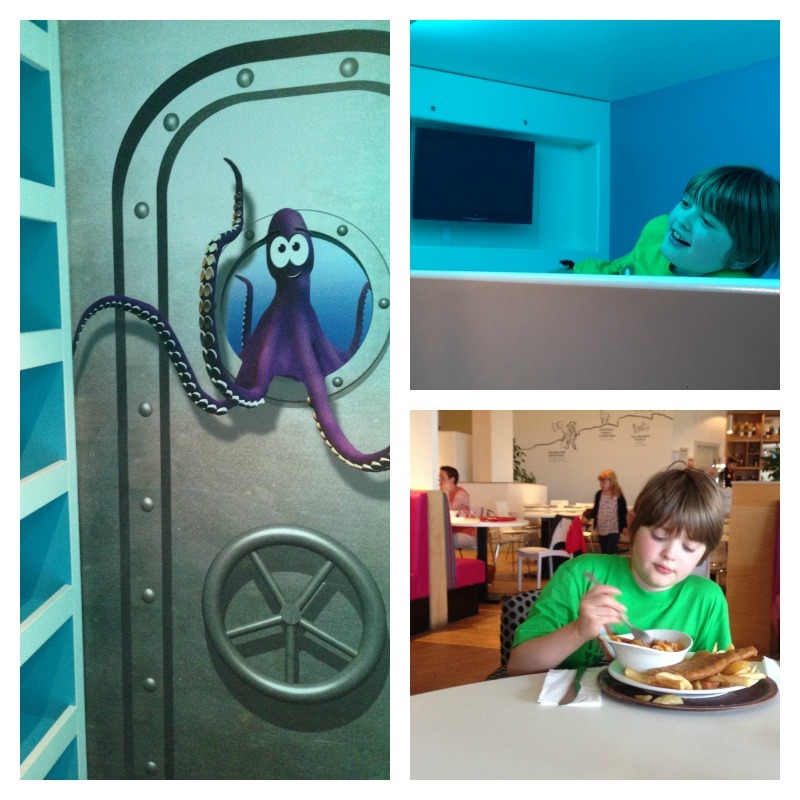 We liked the decor, our interconnecting rooms were large, clean and comfortable and the children loved their mini ocean-themed rooms with bunk beds and TVs. They wanted to watch a DVD straight away which gave me time to test our bed. It was so comfortable that I nearly didn’t get up again, and when I finally went to bed that night I had the best sleep I’ve had in ages. 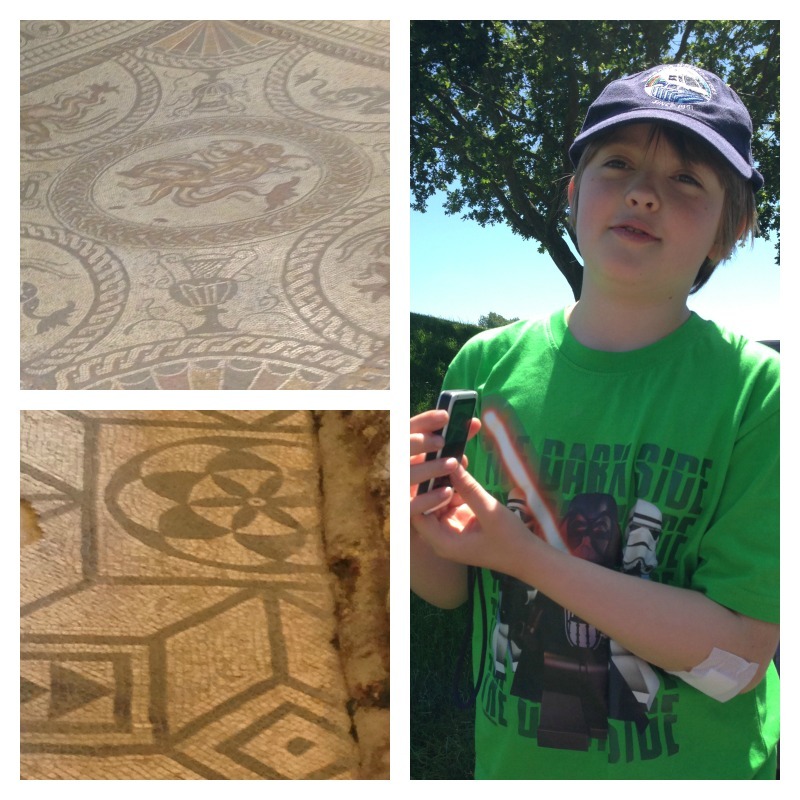 On Tuesday we decided to explore the local area, and we had a brilliant day out at Fishbourne Roman Palace which is only a 20 minute drive from Butlins. This was the highlight of the holiday for me and we will definitely be going back there soon. Wednesday was a difficult day as Rabbit wasn’t well, so we (Paul, mum and I) took turns looking after her while the others entertained the boys. Luckily there is plenty to do on site, so the boys had a good day. The combination of soft play, shows, the fairground, swimming and the games port at the hotel kept them very busy and happy. Our highlight of the day was a fantastic evening meal at Turner’s restaurant, which Paul and I were able to enjoy with the boys as mum kindly offered to look after Rabbit. 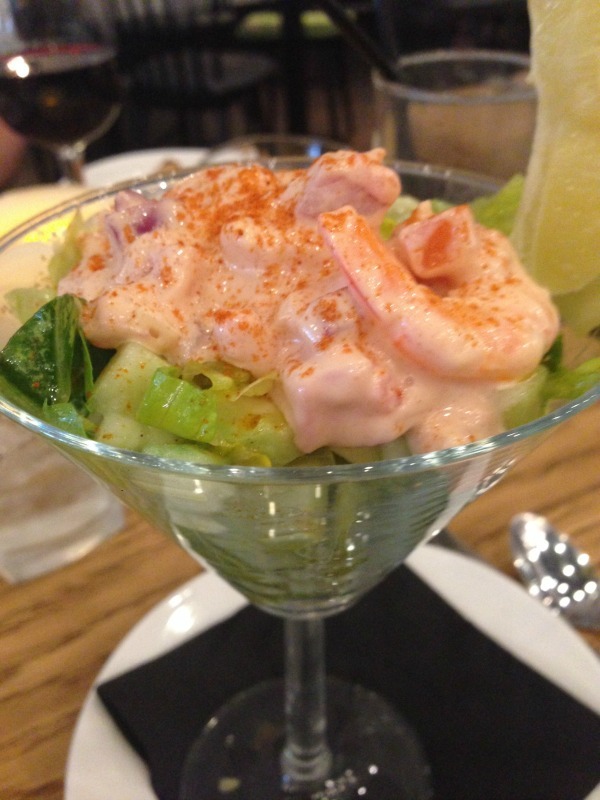 I will review all the restaurants we tried in a separate post, but we were really impressed by Turner’s in particular. 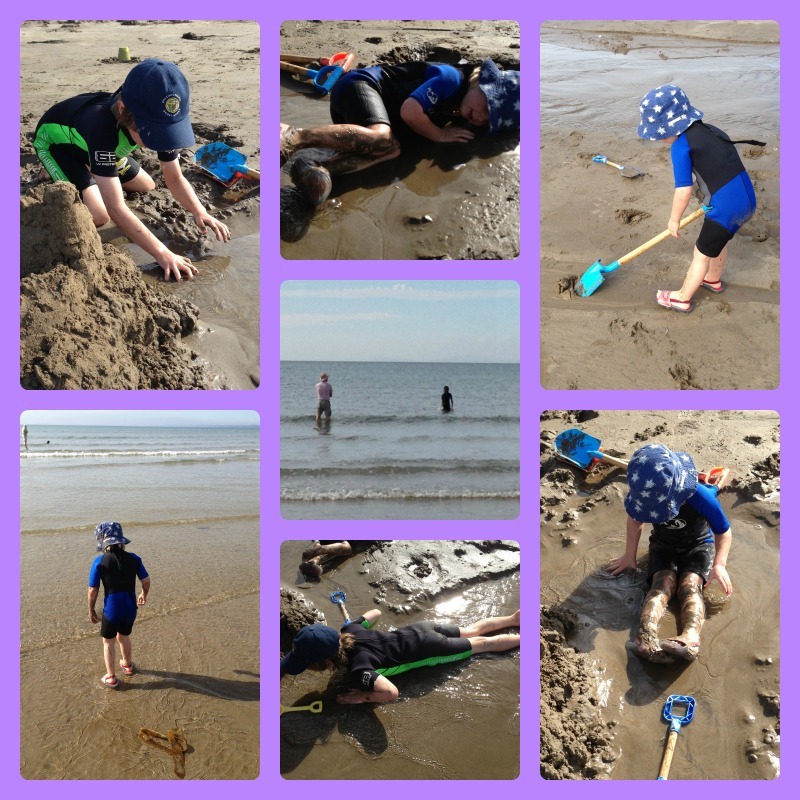 On Thursday we spent the morning on the beach which is right outside the day entrance to Butlins, and we had a lovely time. 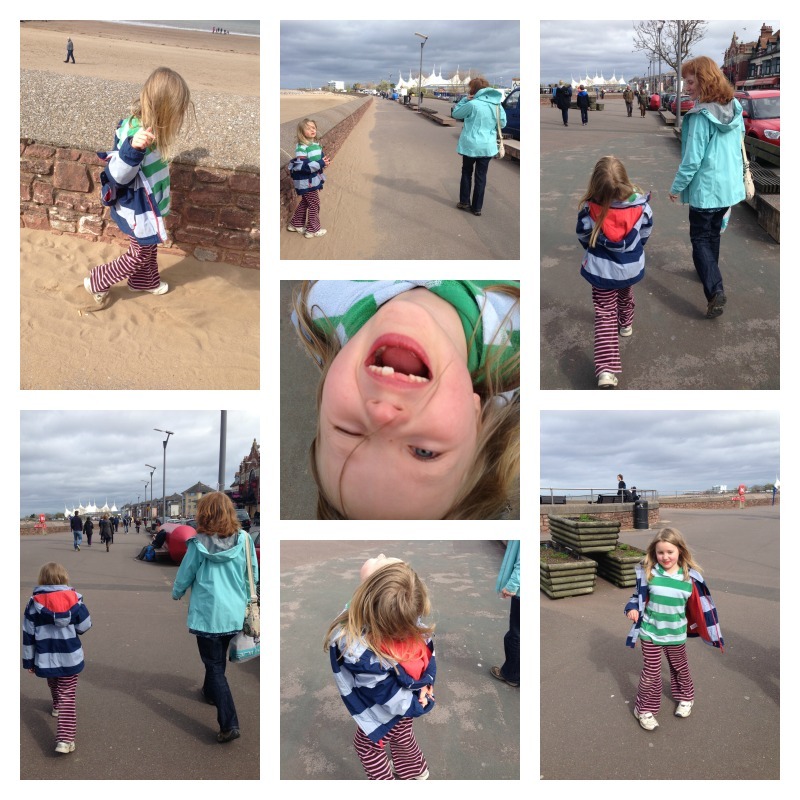 It was nice to see Rabbit enjoying herself – though still unwell, she was a bit better than she had been the day before, and was able to have some fun in the sea before getting tired and needing to rest again. 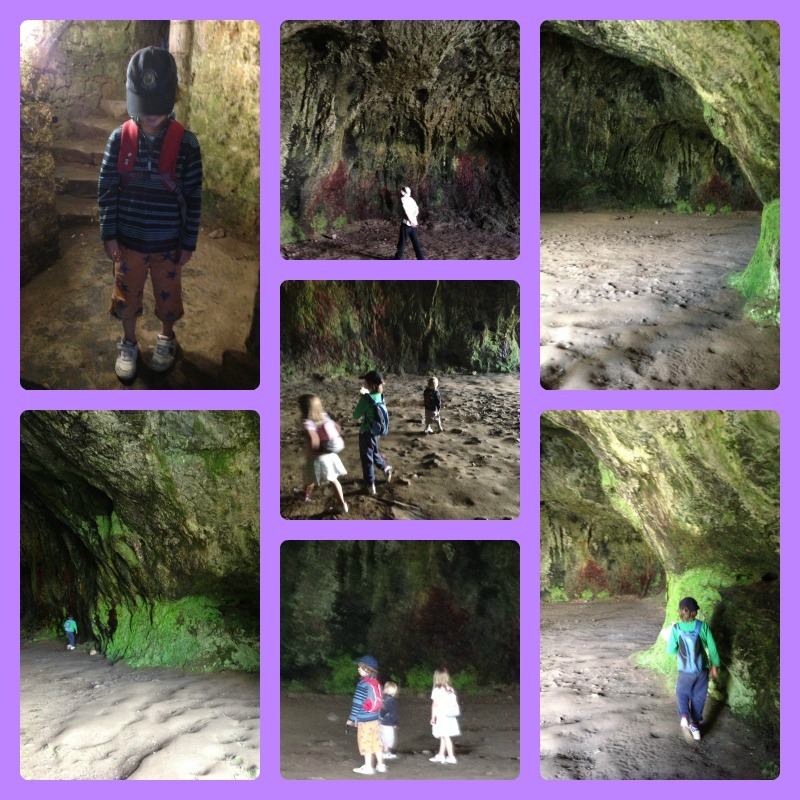 On Friday, the children were sad to be leaving Butlins but we had planned a detour on the way home to cheer them up. 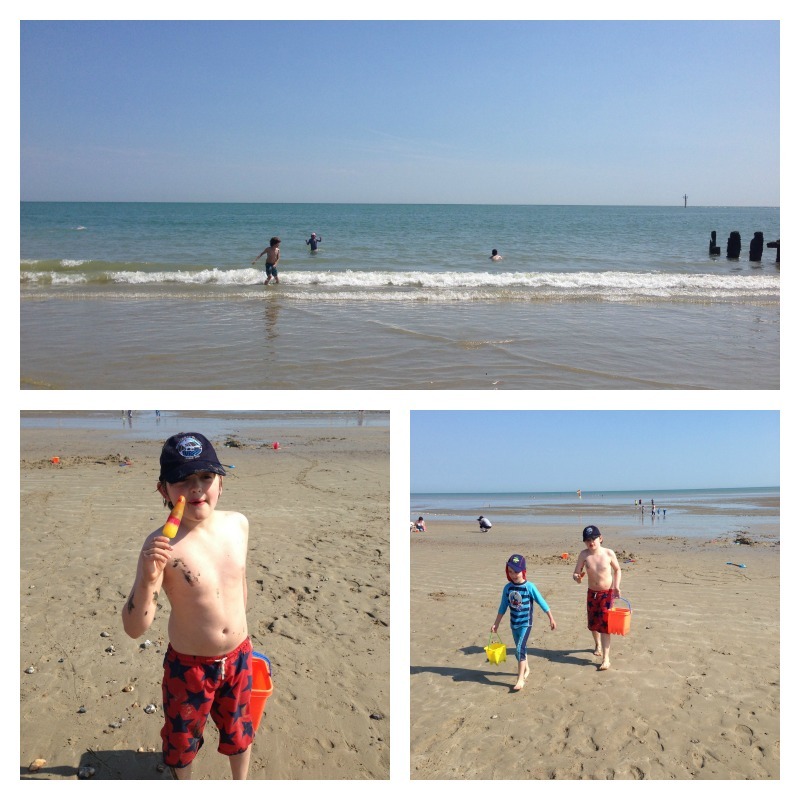 We met with our friends from 3 Kids and a Gluestick and had a brilliant afternoon at Littlehampton beach, which is also only 20 minutes away from Butlins by car. Rabbit was quite a lot better by then, so she was able to enjoy herself with her friends and swim in the sea which helped to make up for having missed the chance to go swimming at Butlins. We had a really good holiday and we have promised the children we will be going back to Bognor Regis as soon as we can. I never thought we would persuade them that another Butlins could be as good as Minehead, but now it looks like they are expecting to go to both every year. Perhaps we’d better not let them discover Skegness just yet! We were invited to stay on a 4 night break at Butlins Bognor Regis as part of my role as a Butlins Ambassador. All opinions are my own. 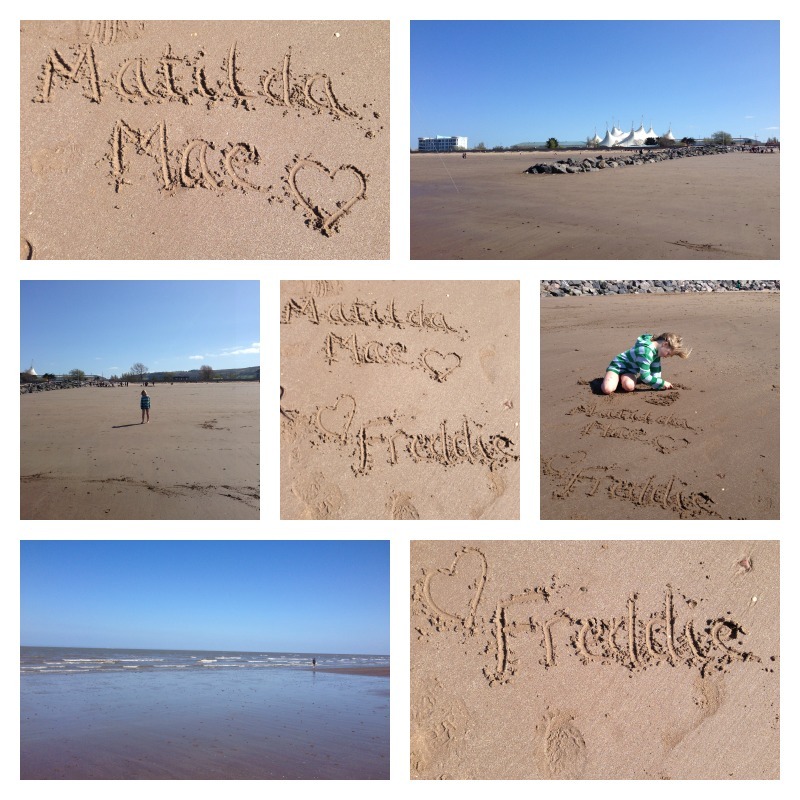 This entry was posted in Butlins, Holidays and tagged beach, Bognor Regis, butlins, Butlins Ambassadors, holiday on June 17, 2014 by Hannah. We’re spending Christmas with my family this year, and I’m looking forward to it. My brother and his wife will be over from Australia, which makes it a special one, and some friends from way back when will be joining us with their toddler. With such a lovely crowd, I’m sure it will be a good one, but I must admit that some years we feel tempted to get away from it all and go on holiday for Christmas instead. I’ve just found out that Butlins stays open over Christmas and New Year, which I didn’t realise before, so I’ve been fantasy planning for future years! I was pleasantly surprised that it’s cheaper than I thought it would be – Christmas themed breaks start from only £41 per person, for a 3 night break. Since the weather turned colder, our children have been asking me to check the forecast every day to see if it is going to snow, and of course they are dreaming of a white Christmas. At Butlins this year, it’s guaranteed! In each of the resorts, there will be a magical Snowstorm show that takes place in the Skyline Pavilion. There are Christmas themed short breaks at all three Butlins resorts, at Bognor Regis, Minehead and Skegness, from 13th December. 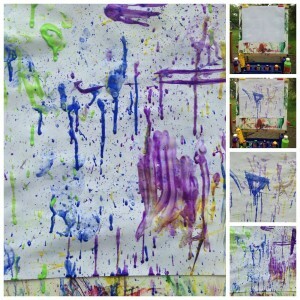 There are a lot of fun activities included in the price of the break. 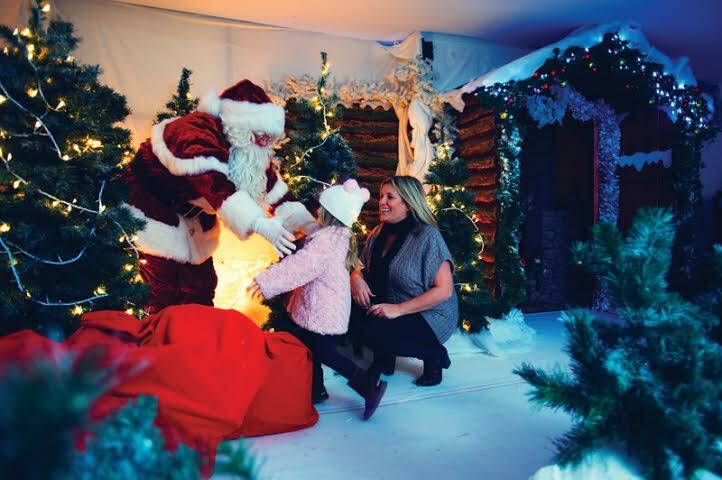 As well as the Skyline Snowstorm, there’s a Winter Wonderland – where every child will get a free gift from Father Christmas, an Ice Rink, Christmas themed arts and crafts, and a traditional family pantomime. If you are staying over Christmas Day, you will be treated to a 5 course Christmas dinner, so you won’t have to worry about cooking or washing up! 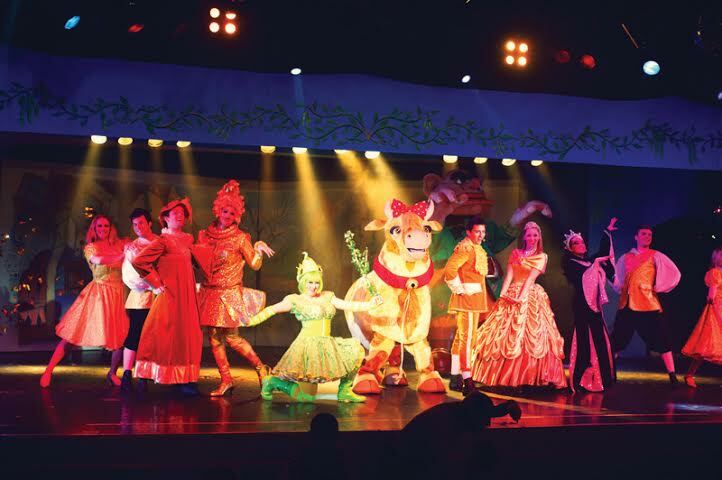 There will also be live entertainment from children’s TV characters like Mike the Knight or Angelina Ballerina, and there are so many things for kids to do around the resorts, the only problem might be fitting everything in! The indoor sub-tropical Splash Waterworld is always popular with our children, and there are traditional fairground rides too. If you are visiting over New Year, your break will include a New Year’s Eve party for the whole family, with a spectacular fireworks display, and live entertainment throughout your stay. You can book online or call 0845 070 4730. All breaks are priced per person and subject to availability. 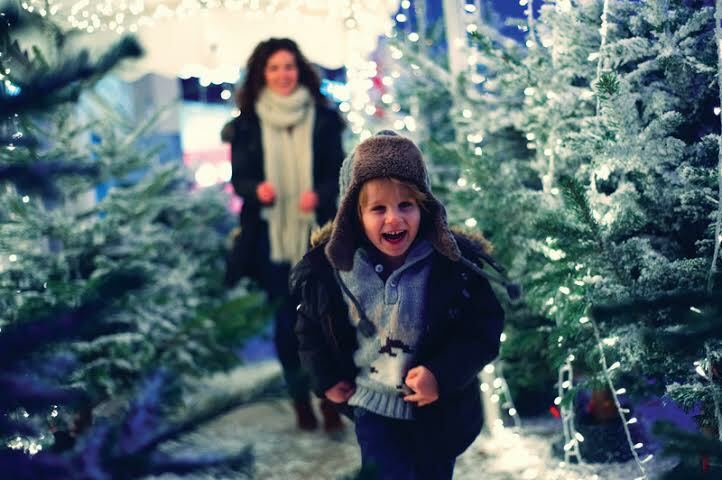 I love the idea of a family holiday at Christmas, and if it fits in with the plans of our extended family, we would definitely consider it in future years. We are Butlins Ambassadors for 2013 and 2014. Although we won’t be there at Christmas this year, we are looking forward to visiting both Minehead and Bognor Regis in 2014. 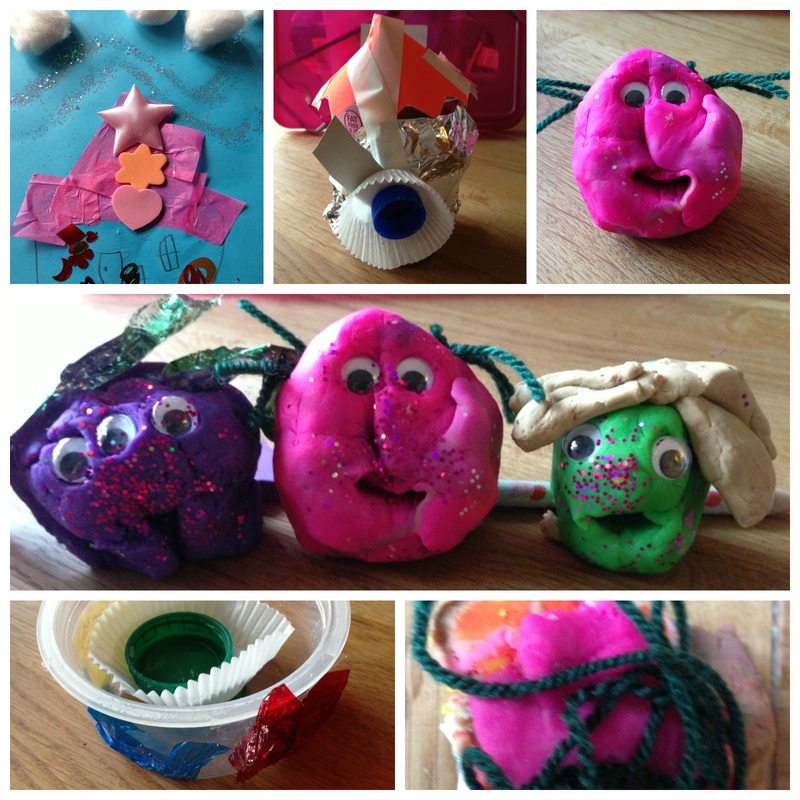 This entry was posted in Butlins and tagged butlins, Christmas, New Year on November 26, 2013 by Hannah. 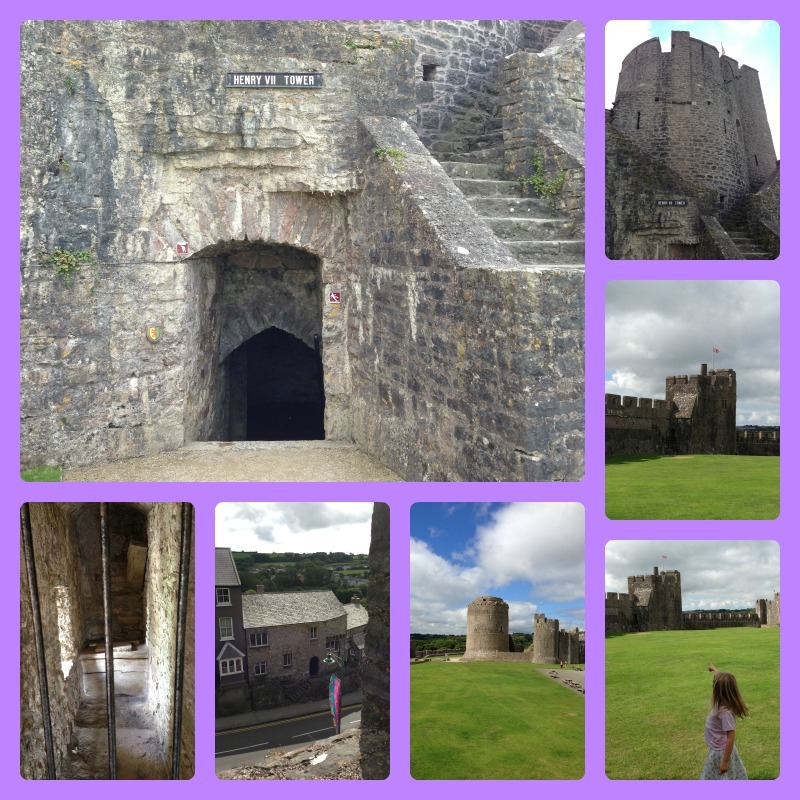 It has been exactly three weeks now since we went on holiday to Wales – yes, it has taken me that long to sort through all the photos for this blog post! 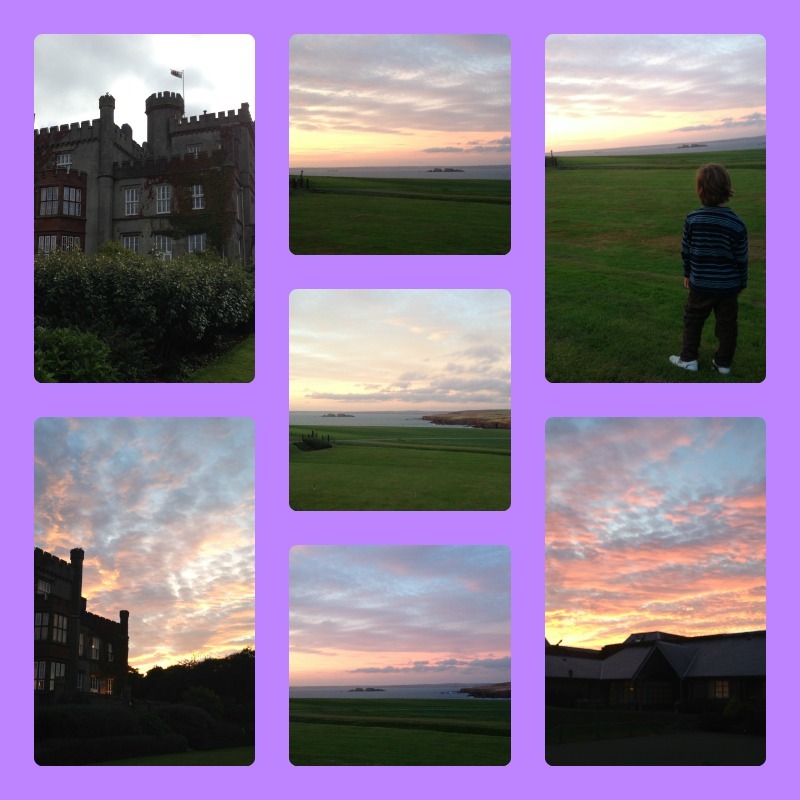 We went with Granny and Grandpa (my parents) and stayed at St Brides Castle in Pembrokeshire. 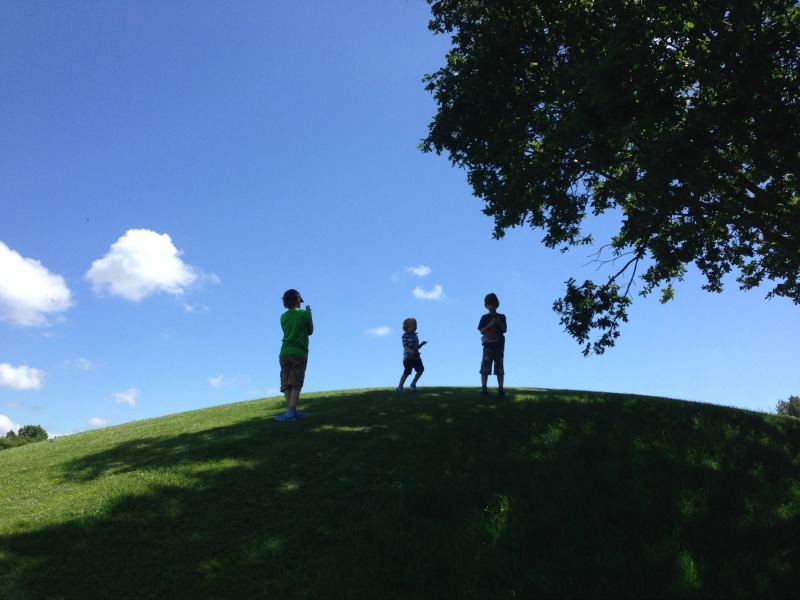 After a long journey, we arrived late in the afternoon and the children couldn’t wait to get out of the car and explore. 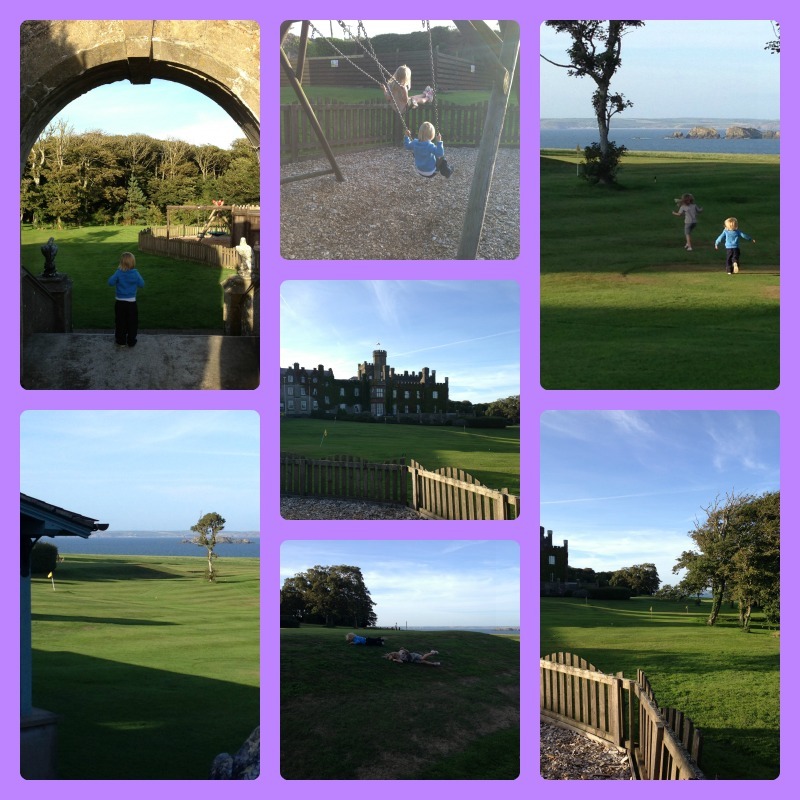 The first stop was the play area, and then the little ones ran down to look at the sea – the view was amazing! 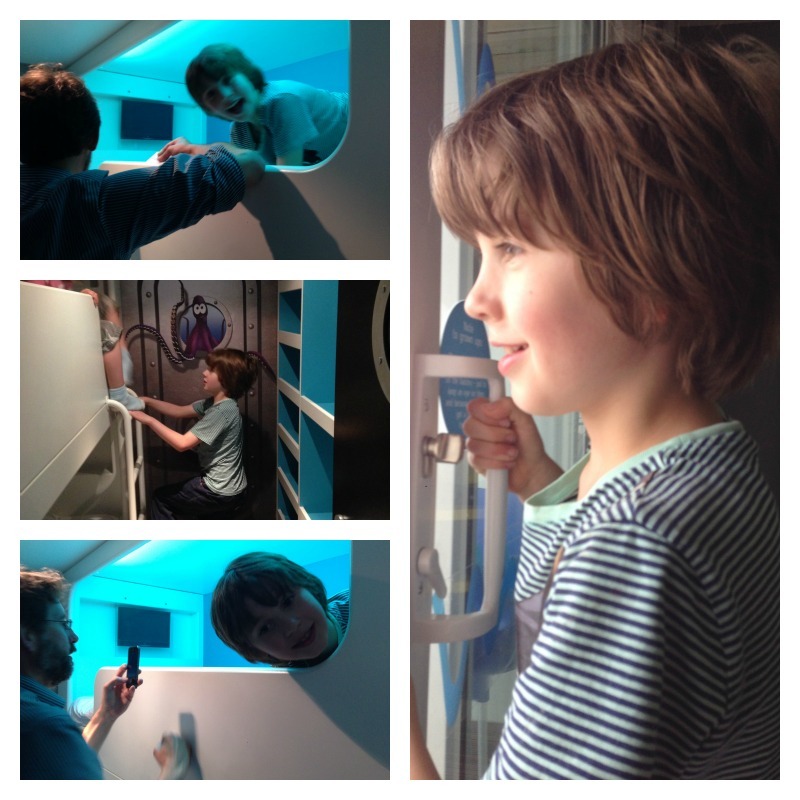 After playing outside for a while, we went to check out the indoor facilities – there was a games room, a library, a mini gym and a swimming pool with sauna and steam room. We were too tired for swimming on the first evening, but we made use of the pool eight times in the following six days! 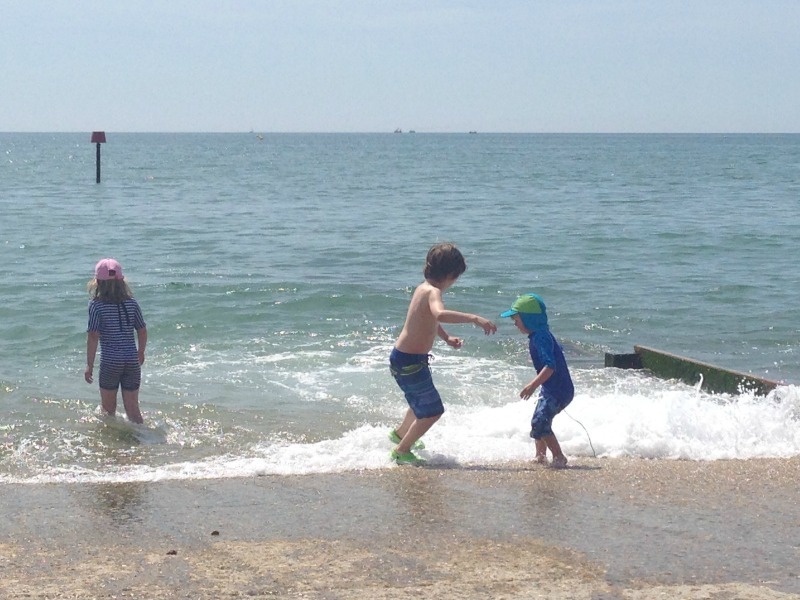 We spent Sunday morning in the games room and swimming pool, and then in the afternoon Monkey, Tiddler and I walked down to the small beach nearby with Granny, while Rabbit and Owl stayed with Daddy and played tennis. 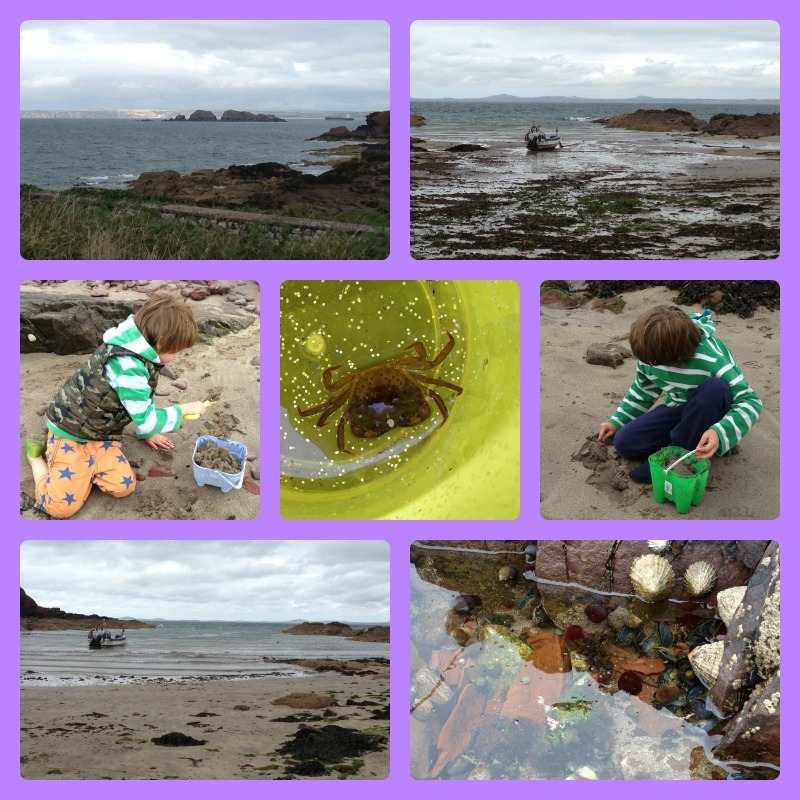 The tide was high so the beach was small, but it had some great rock pools to investigate. I think I was more excited about that than the boys, though they did enjoy it. 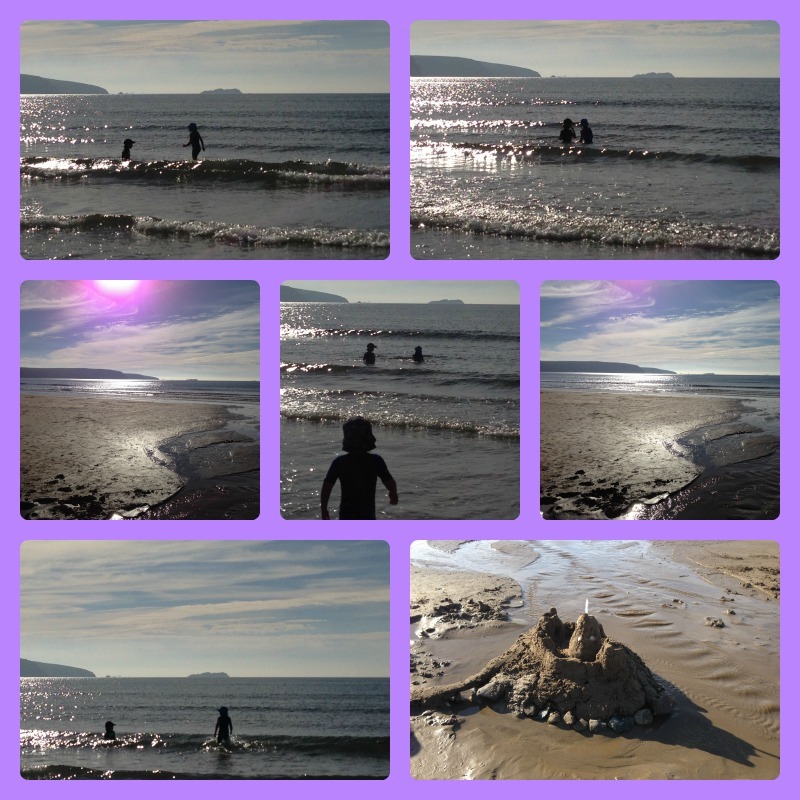 It was very rocky but there was just enough sand to make some sandcastles. I really enjoyed watching the boys work together. Monkey was frustrated at first with Tiddler’s attempts to “help” but once he managed to explain what he wanted him to do they were a very good team. 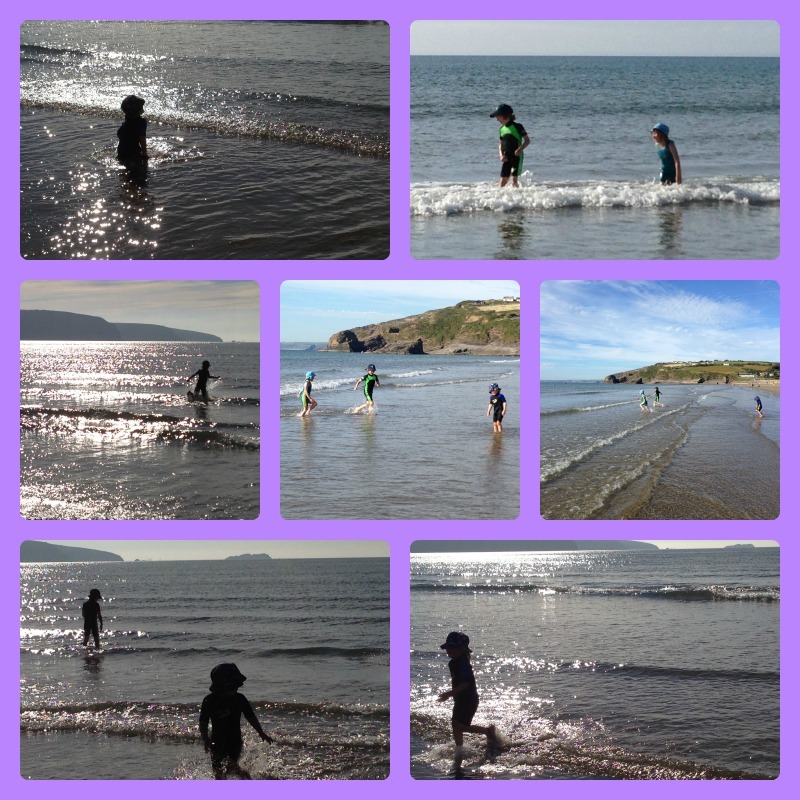 At the end of the afternoon, we took the big three swimming again, while Granny looked after Tiddler. After supper, we went to the games room for a little while, and returned just as the sun was setting. Monday was a quiet day. In the morning we spent quite a long time in the games room, playing table tennis, pool and board games, and then Daddy and Granny took the children swimming. 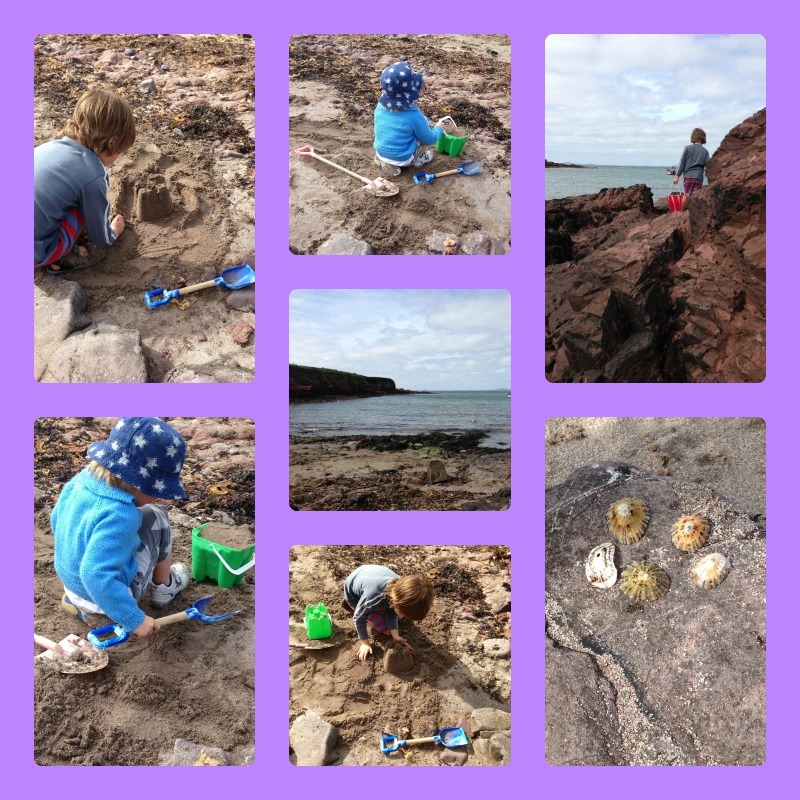 In the afternoon we did some food shopping with Monkey and Tiddler, while Owl and Rabbit went to the little beach with Granny. 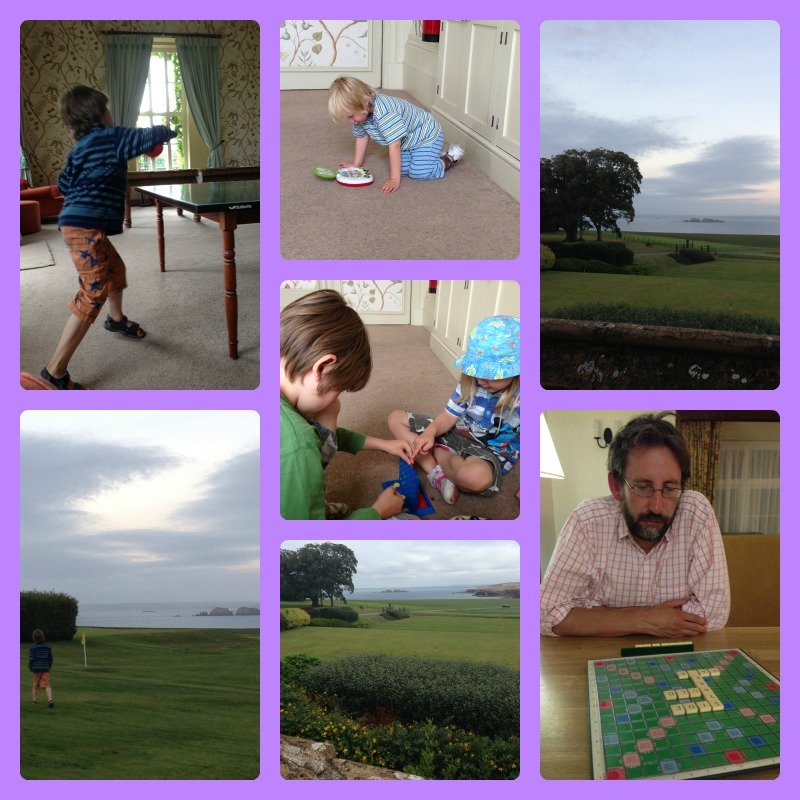 We were back in the games room again in the evening, but managed to get the children to bed just in time for Mummy and Daddy to fit in a game of Scrabble – look at that, not a laptop in sight! There’s something to be said for having a very poor Internet connection when you are on holiday. 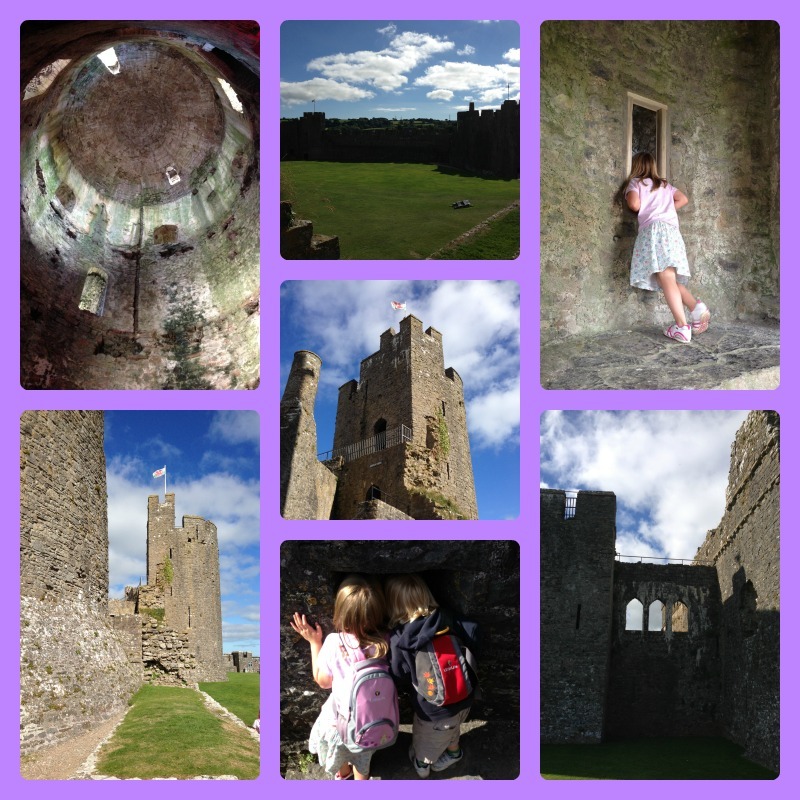 Tuesday was our castle day. 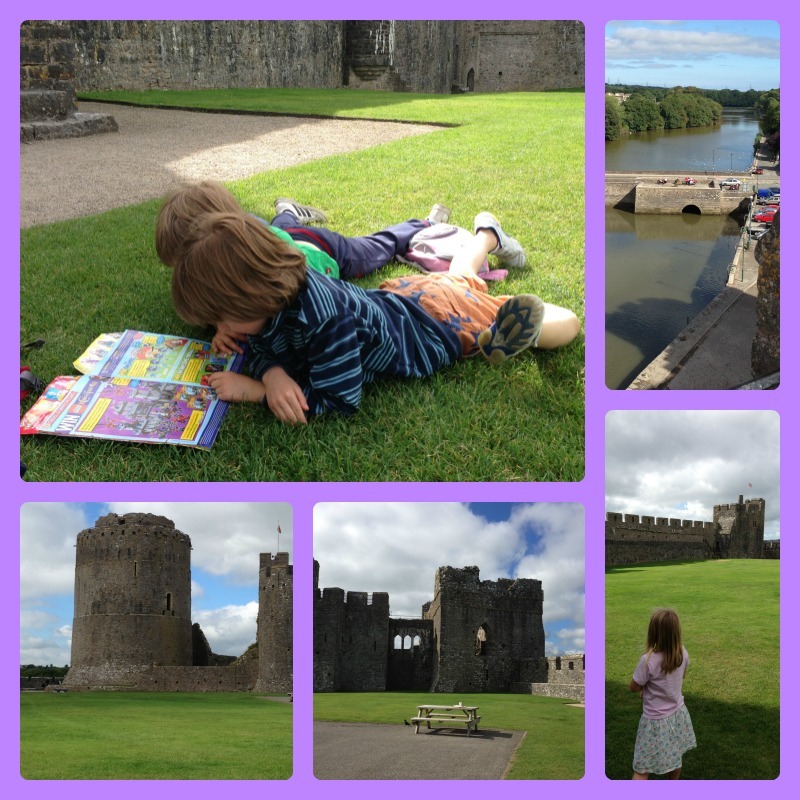 We always like to visit a castle while we are on holiday if we can, and as we were in Wales we were spoilt for choice. 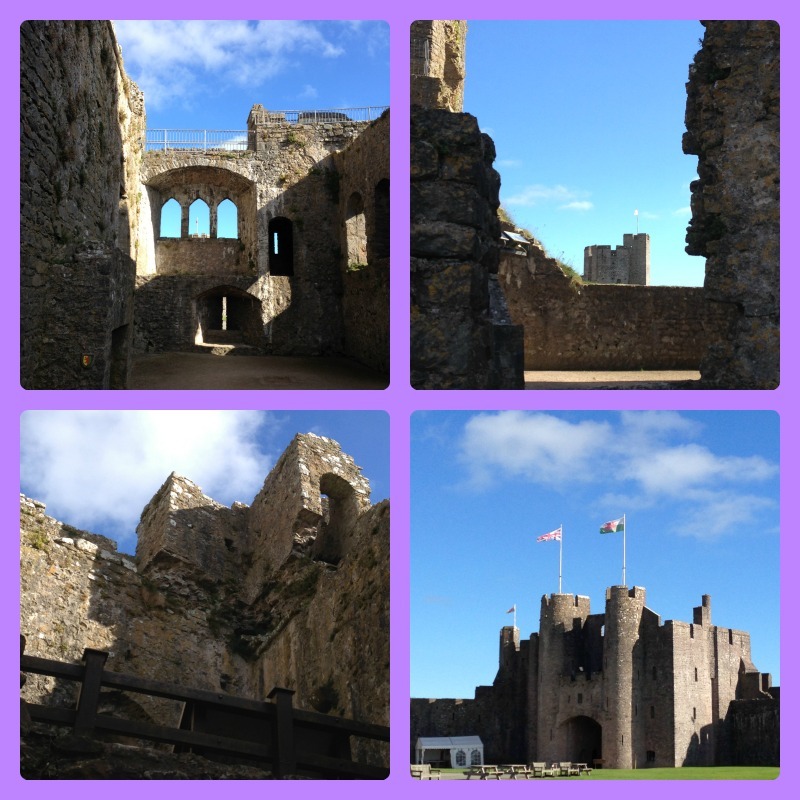 After much consideration, we settled on Pembroke Castle and we were not disappointed. In the morning we got everything ready for our outing, while Granny and Grandpa looked after the children. We arrived at the castle at lunchtime, and had a picnic on the grass outside before going in. 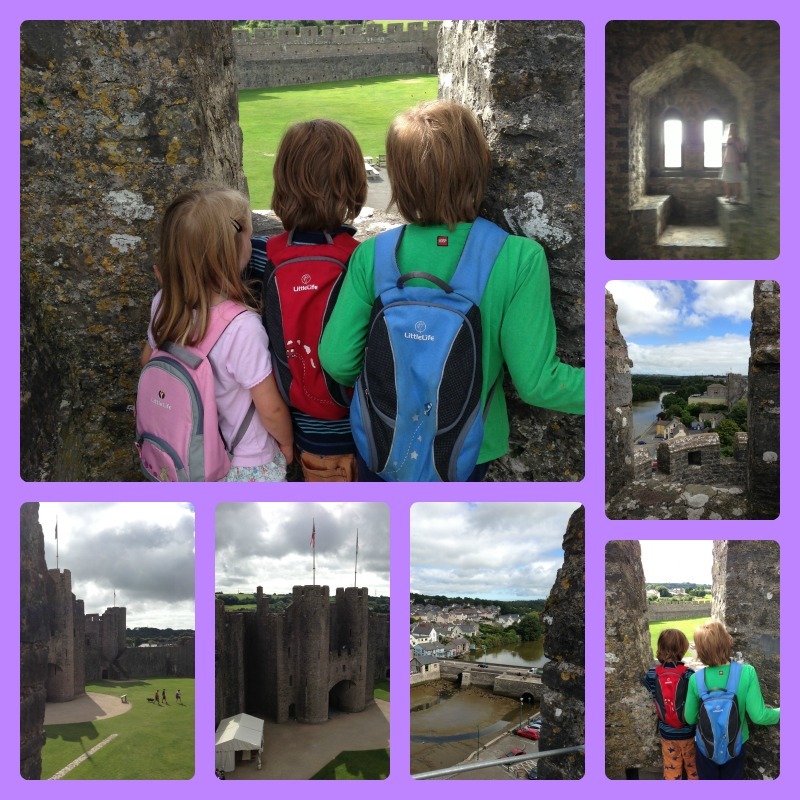 We had a brilliant time exploring the castle and admiring the views. 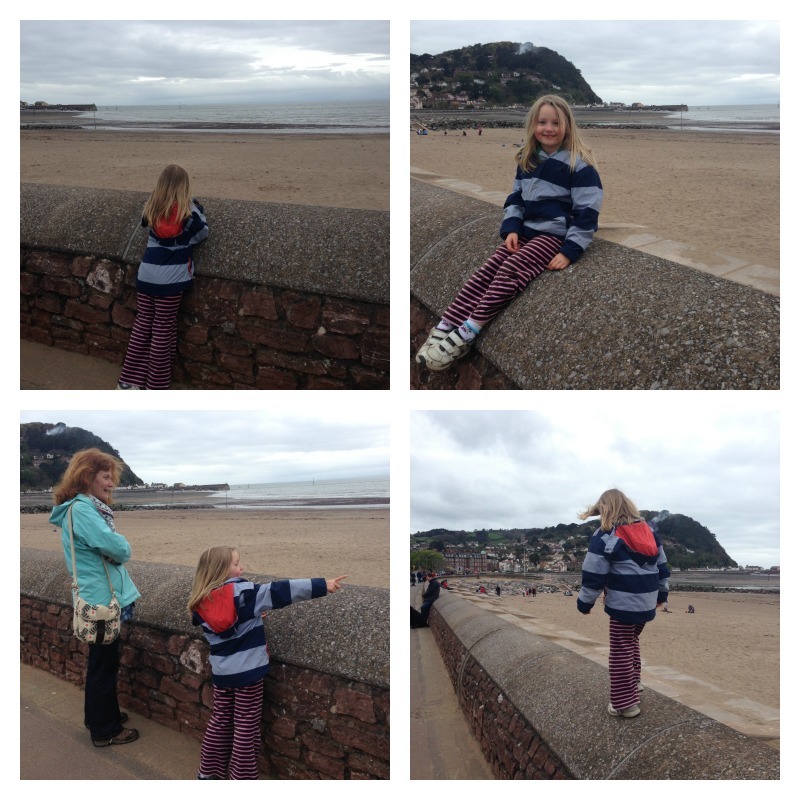 It was a bit scary seeing the children so close to the edge, but they were very sensible. 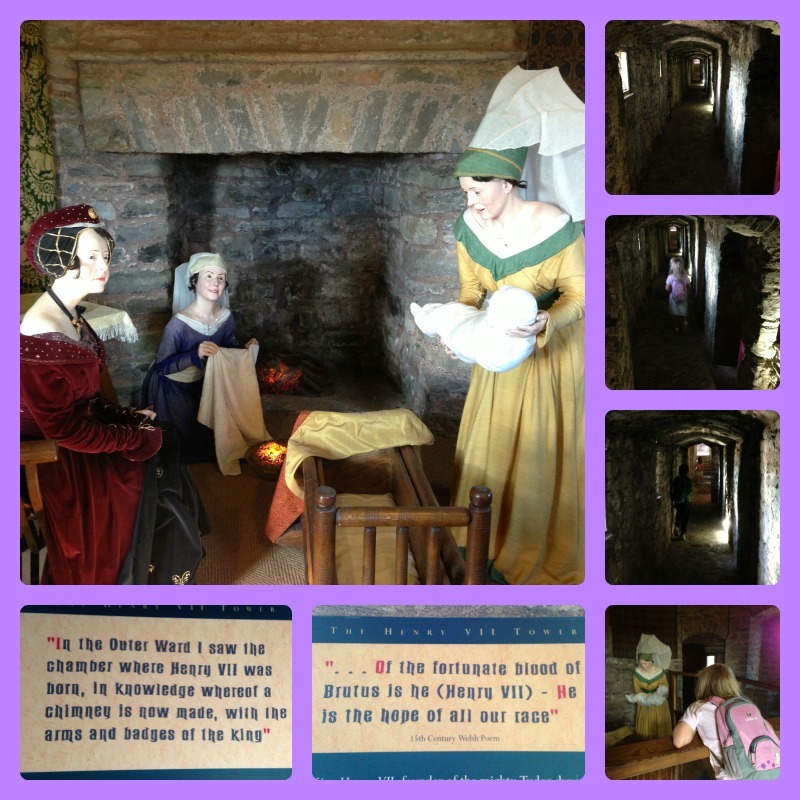 We enjoyed looking at the exhibitions too, with waxwork models showing scenes from castle life at different times in history. … and read your Horrible Histories magazine too! 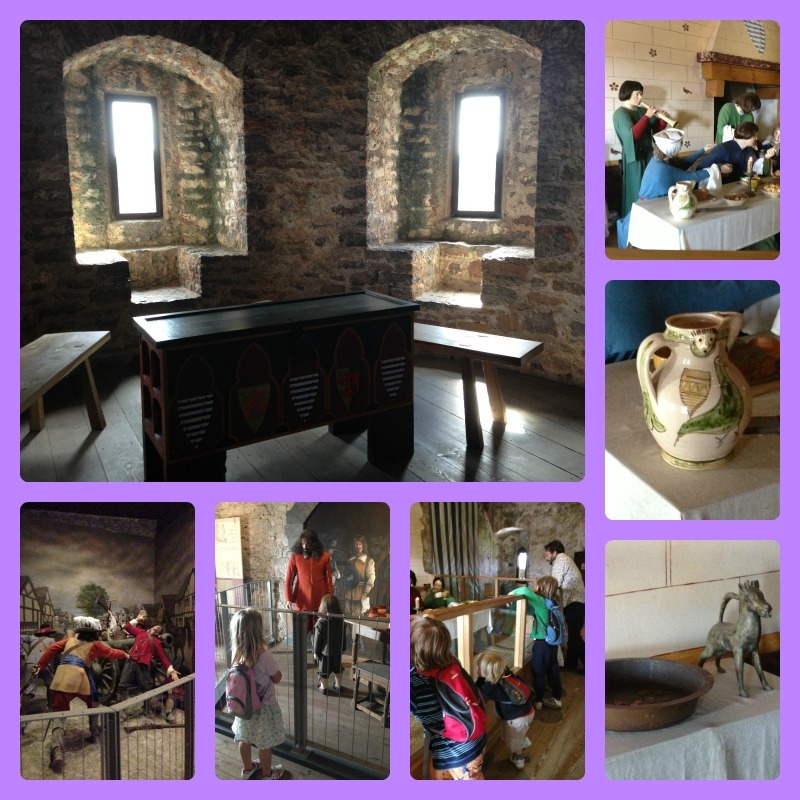 After taking a break, we continued looking round the castle as there was so much more to discover. Back above ground, we had another quick walk round to discover some parts of the castle we had missed earlier, but we all wished we could have stayed for longer. 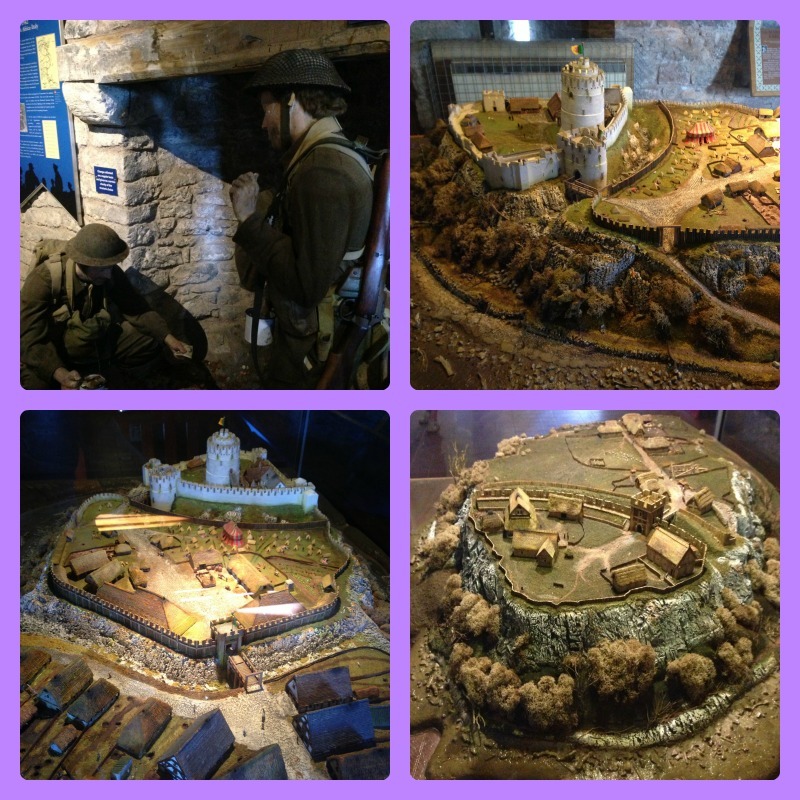 We went back to look at some parts of the exhibition we hadn’t seen before, and Owl was pleased to find a room dedicated to the history of the Pembroke Yeomanry, including their part in the First and Second World Wars. 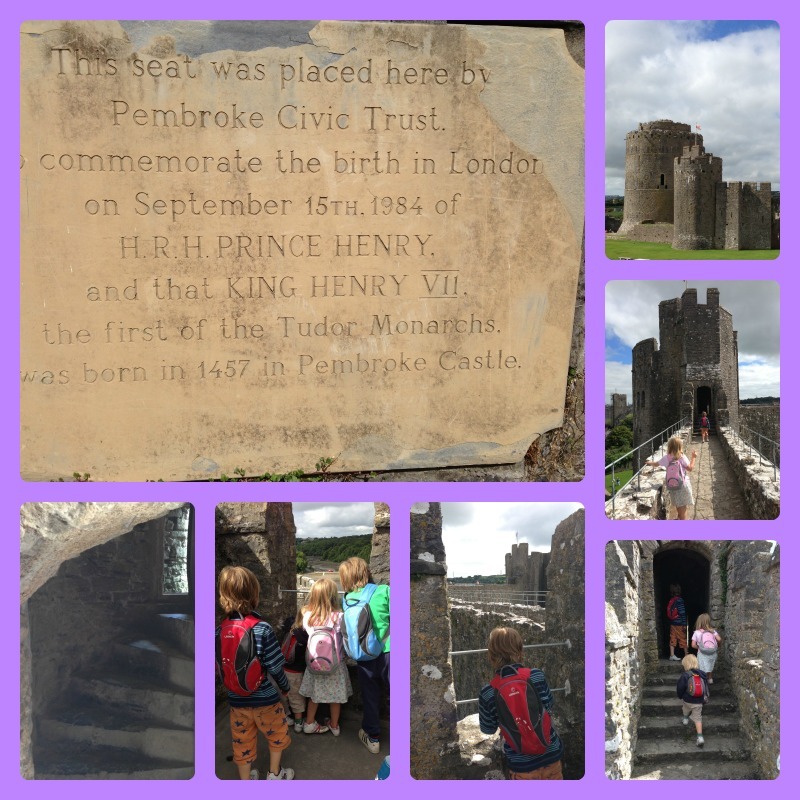 We finished up in the room in which Henry VII was born, and then left via the shop where we bought some really good books and a stick of rock each for the children. Rabbit in particular loved this treat and has been asking when she can have a “sticker rock” again ever since! 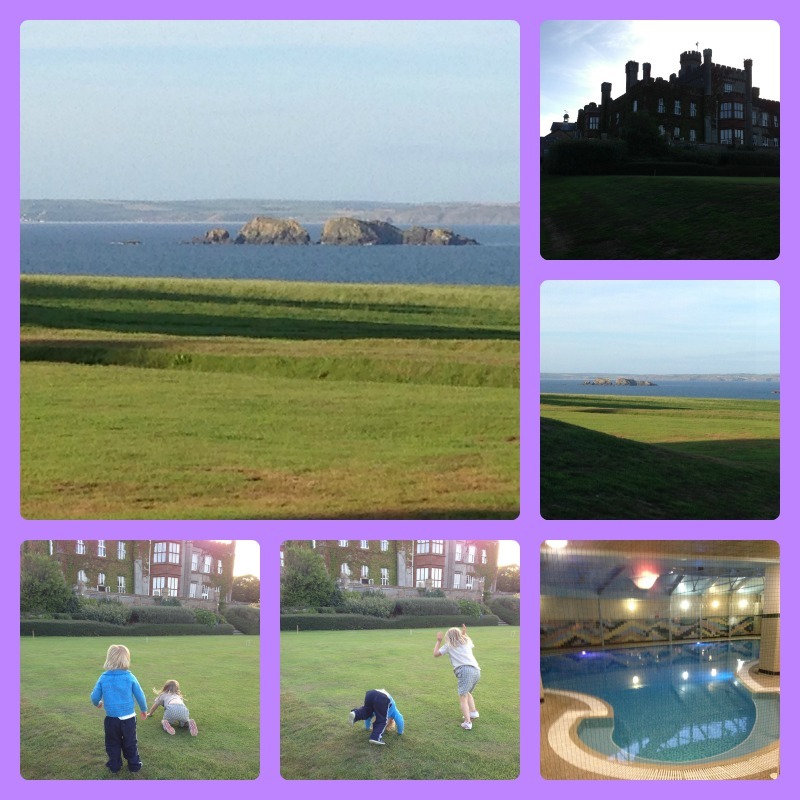 After a brilliant day out, we went back to the holiday house for supper, a late swim and a very late bedtime. 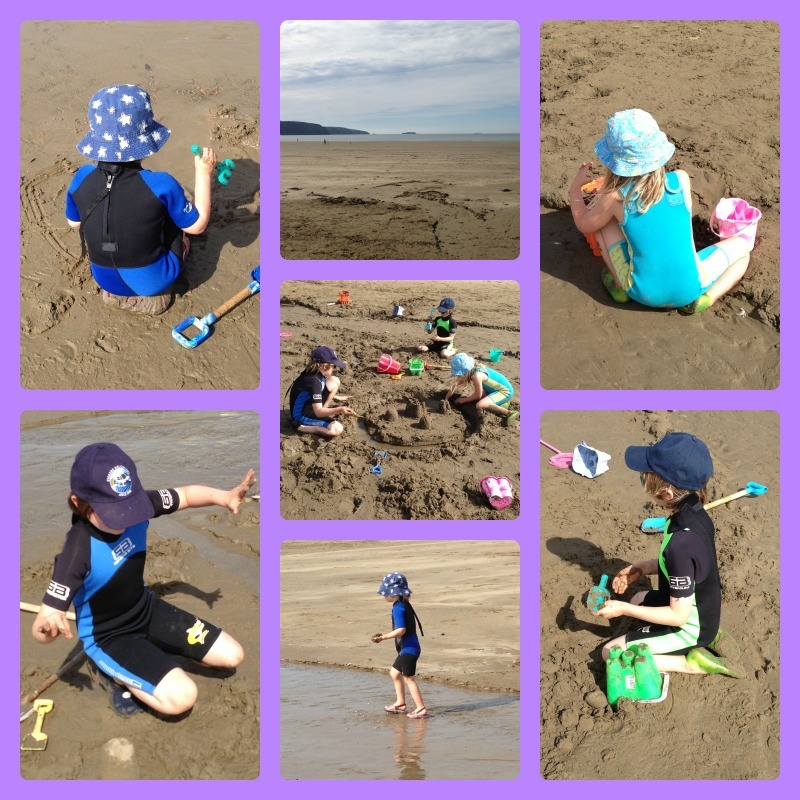 Wednesday was our big beach day, and luckily it was also the warmest day of the holiday. 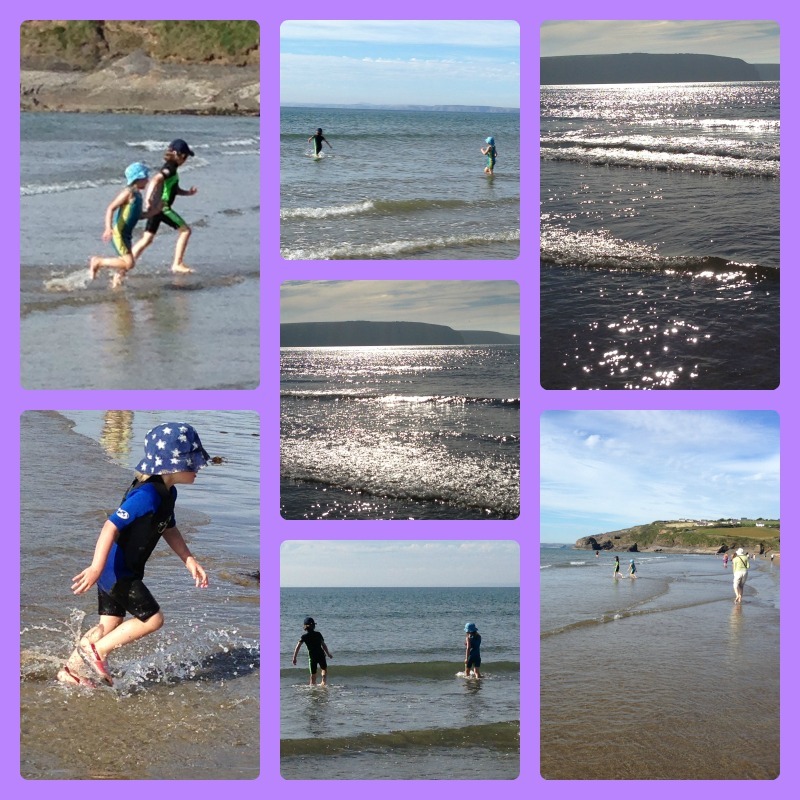 We dithered a bit about where to go, then decided on Broad Haven beach – and it was perfect. After a picnic on the grass at the top, we went down on to the beach. 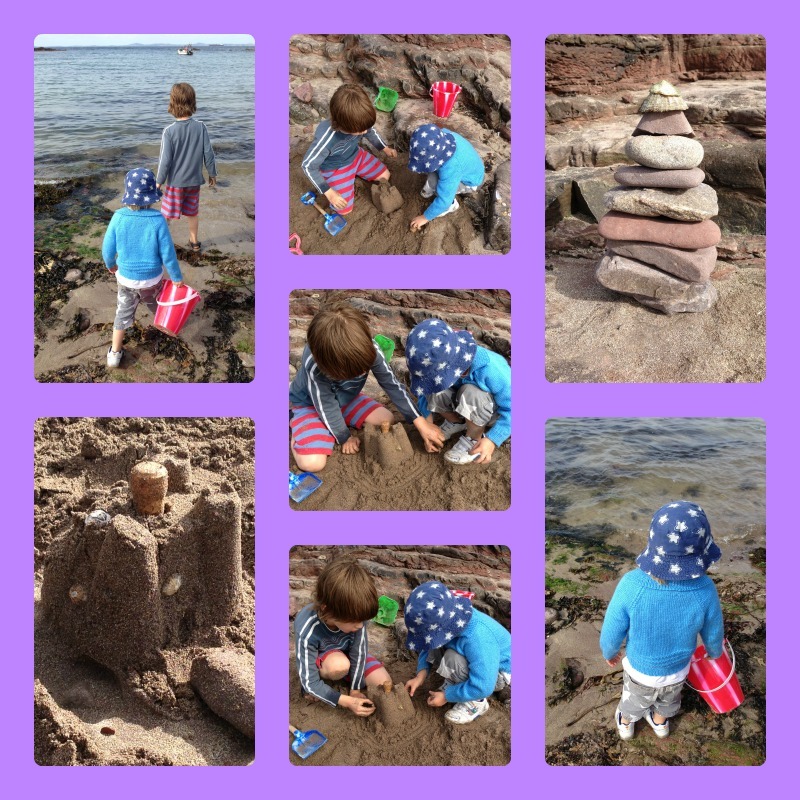 I had fun making a sandcastle with the children – in previous years I’ve been the one feeding the baby or chasing the very small toddler, so it was nice to be able to join in with them this time. I was quite pleased with our efforts, but Daddy was not impressed. Our castle didn’t have a mound so it wasn’t historically accurate enough for him. It did, however, have the benefit of not taking too long to make, which suited the rest of us! 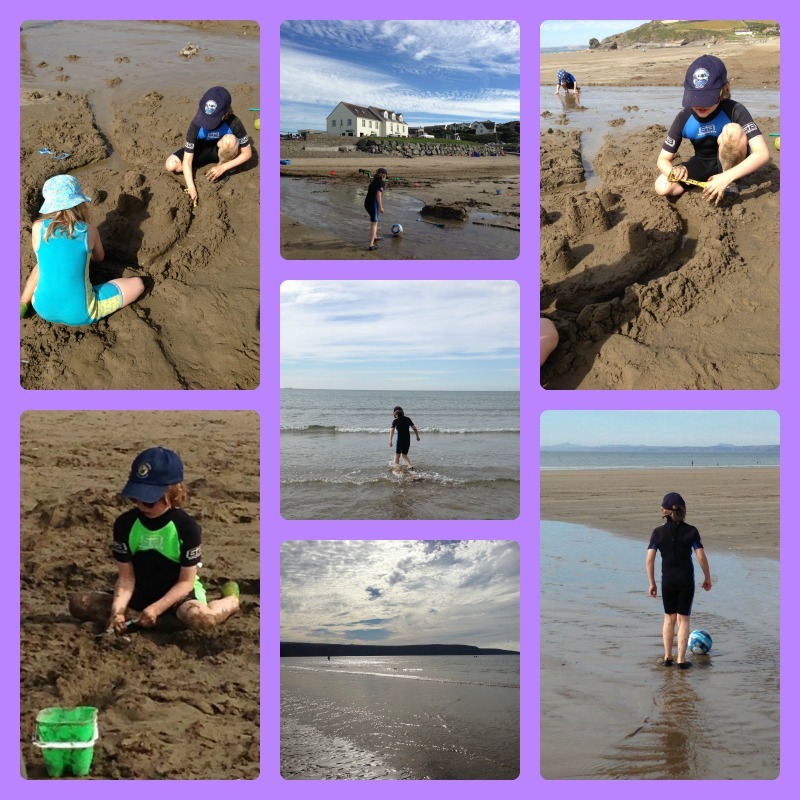 While Daddy set about the long task of making a perfect replica of Pembroke Castle in sand (with a little help from the team on and off), there was plenty of time for channeling water into the moat of the first sandcastle, random digging, playing football and paddling. Tiddler enjoyed getting as messy as he possibly could, and even Monkey (who normally prefers to keep clean) soon got stuck in. Owl and Rabbit were the most confident in the water, but after a while Tiddler and Rabbit joined in too. 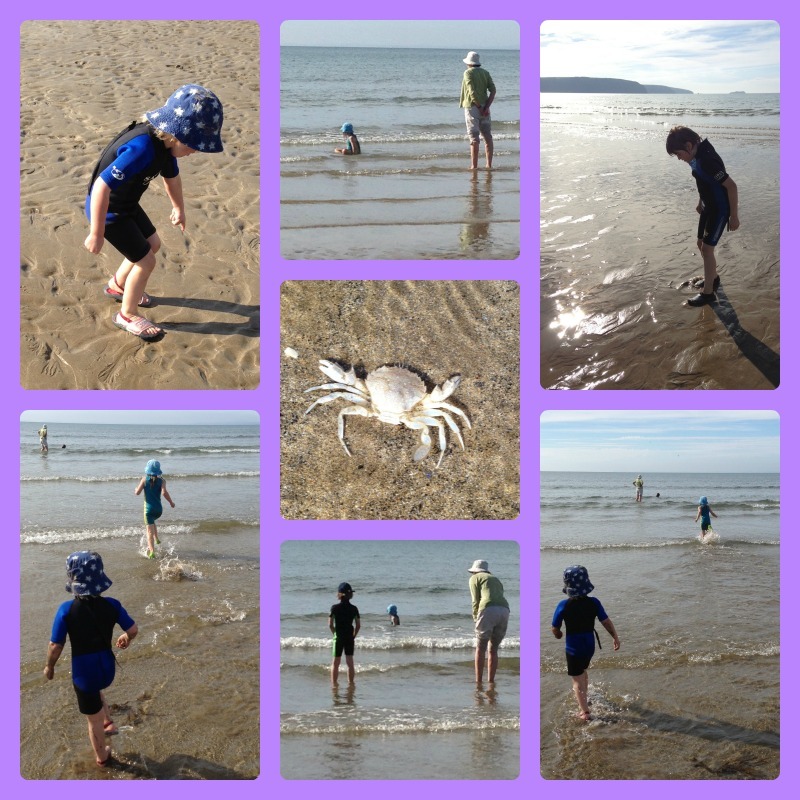 They had a brilliant time splashing and playing, and were all very excited when they “caught” a (dead) crab! We stayed for longer than we had planned because it was just so perfect. 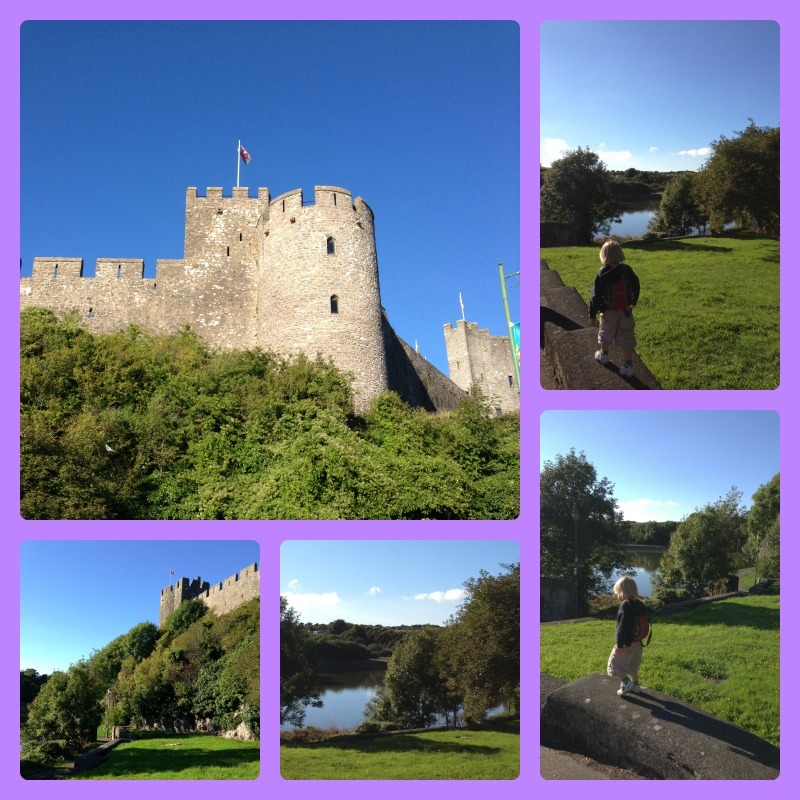 Meanwhile, Daddy finished reconstructing Pembroke Castle to his satisfaction. 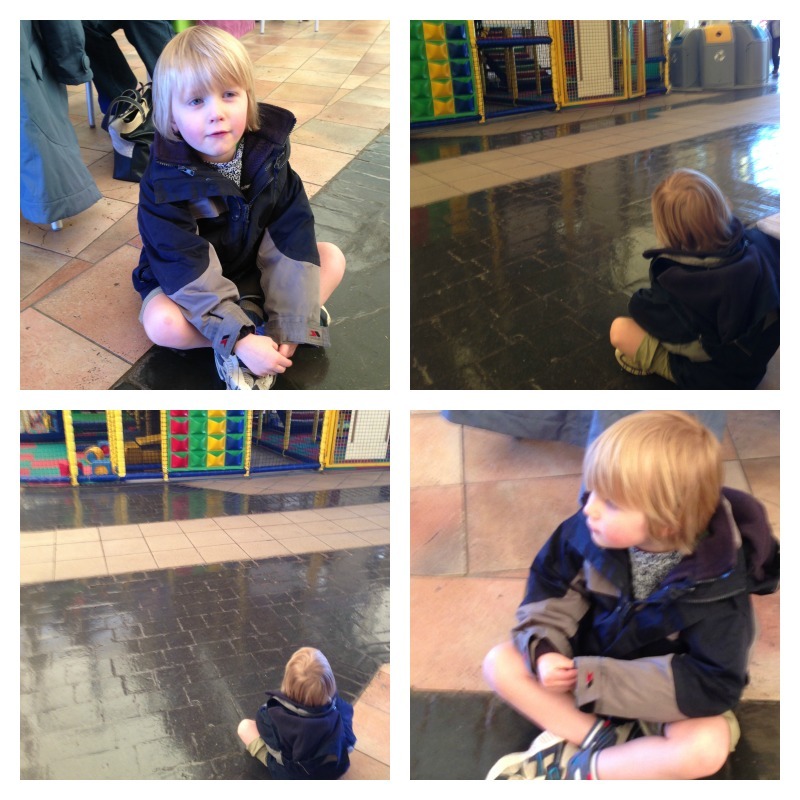 Eventually we managed to get the children to leave by promising to take them to a cafe. 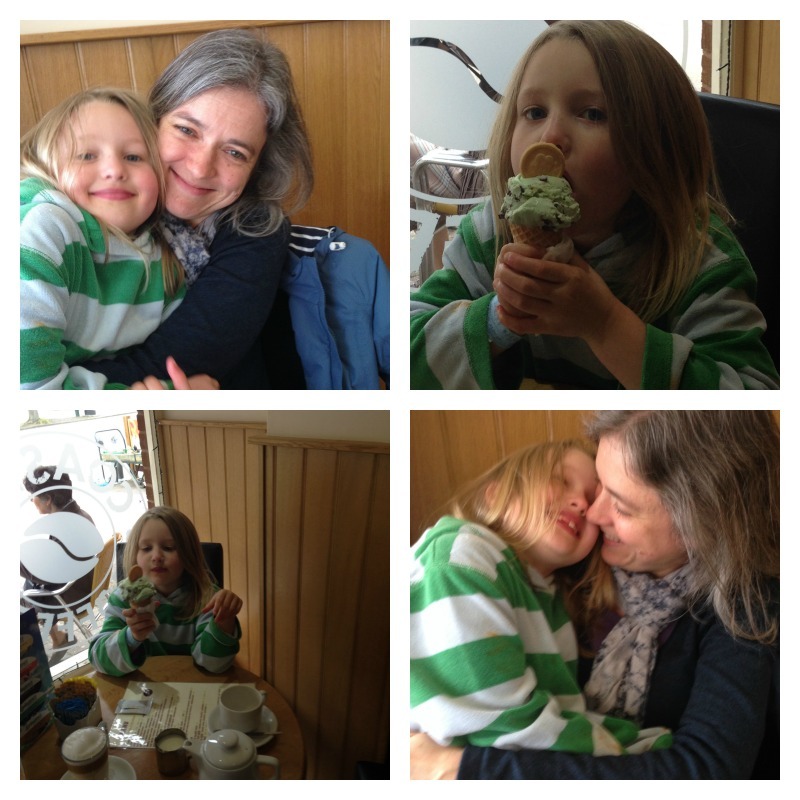 We had some really excellent ice creams, and also ordered fish and chips which we took back to our holiday house for supper. We ended the day with another very late swim. 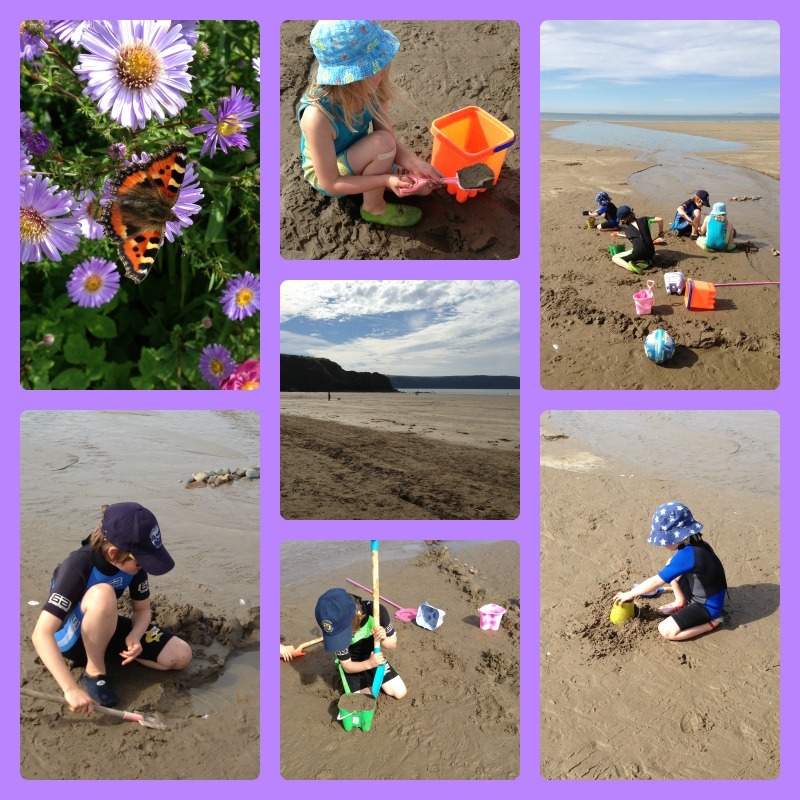 On Thursday we swam in the morning, and then spent the afternoon at the little beach with Granny and Grandpa. 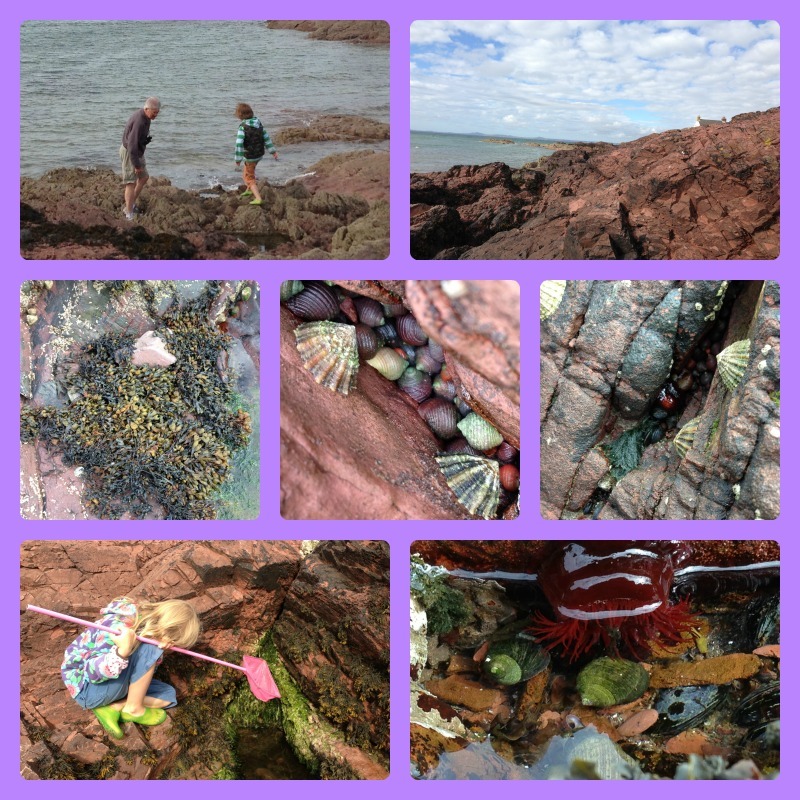 It was low tide this time, so there were even more rock pools to explore. 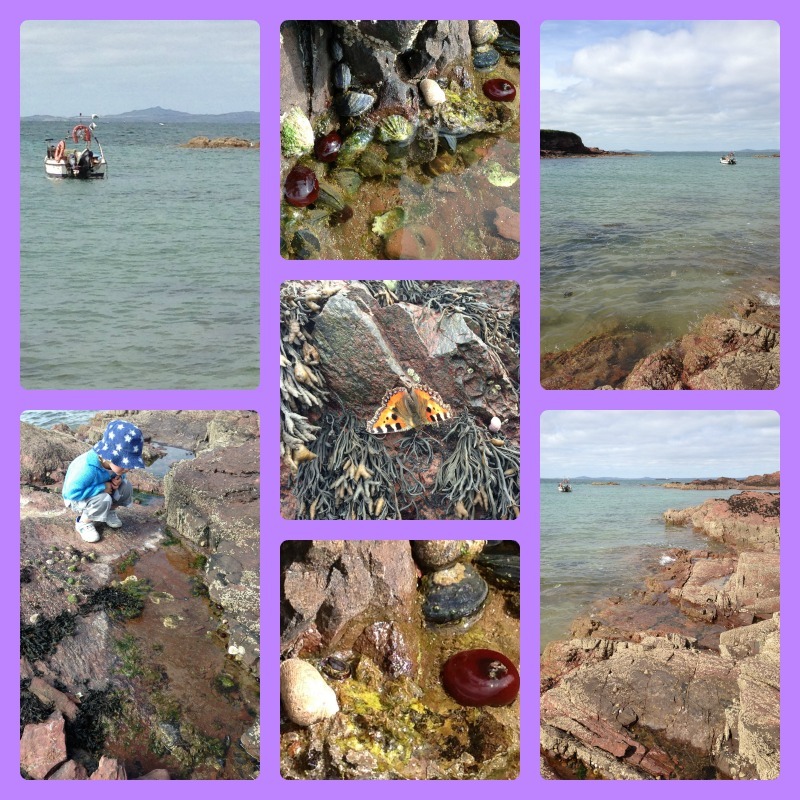 This time I wasn’t the only one who got excited about it, as Rabbit was just as keen on exploring the rock pools as I was! In the evening we went to the restaurant which was just outside our holiday house. It was a very nice meal, though it took quite a long time to arrive – so that was another late night. I quite enjoyed the lazy mornings as the children all woke up late every day, though it hasn’t been easy to get back to a normal schedule since then. We have just about managed it now, but thank goodness for the flexibility of home education, because it has taken us a while! On the last full day of our holiday we decided to stay on site to make the most of the excellent facilities. 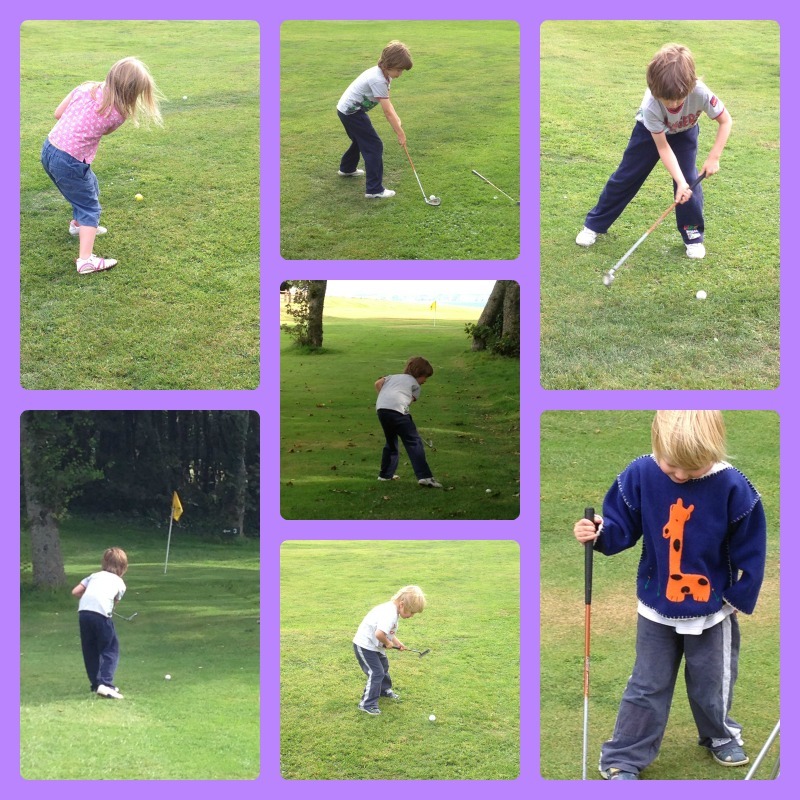 In the morning we all went swimming together, then Daddy, Grandpa and I tried out the pitch and putt while Owl went to the games room with Granny. We joined them there and then said goodbye to Granny and Grandpa who were leaving that day, as they had arrived the day before us. 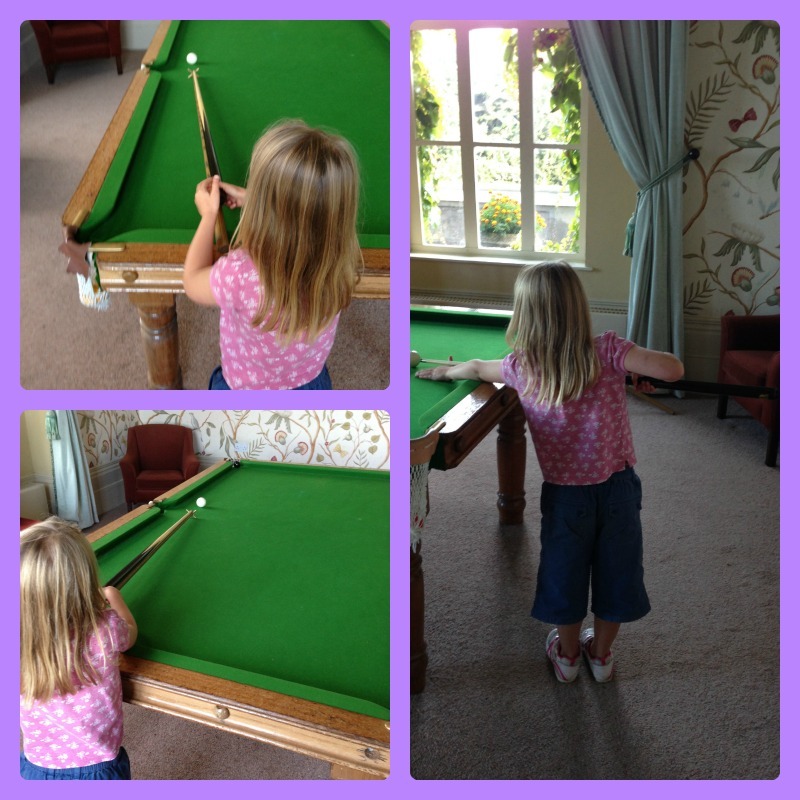 We spent the rest of the morning playing pool, table tennis and Junior Monopoly. 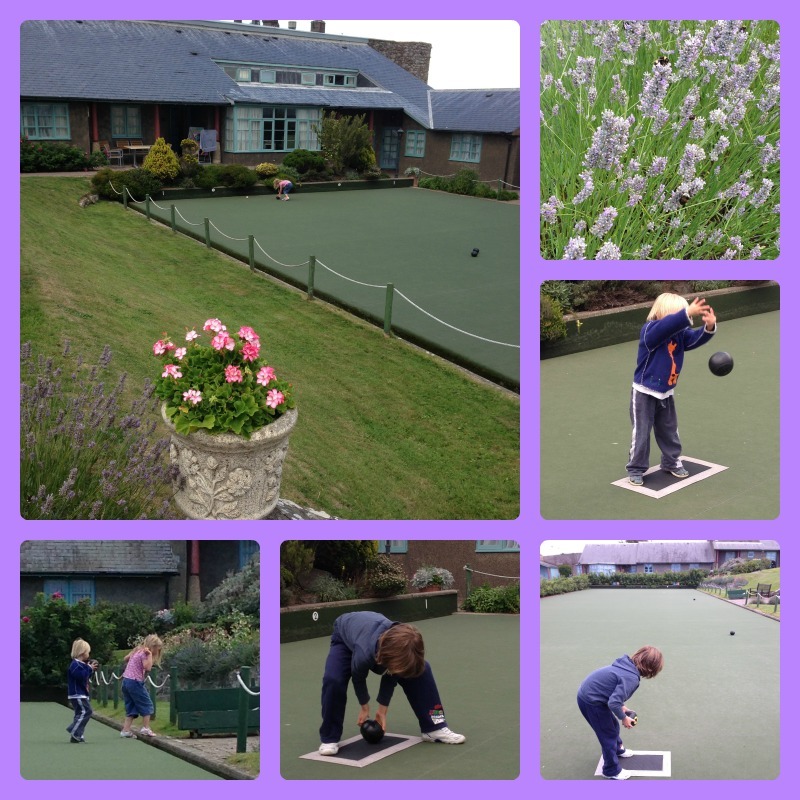 In the afternoon we played bowls on the pitch which was right outside our holiday house. 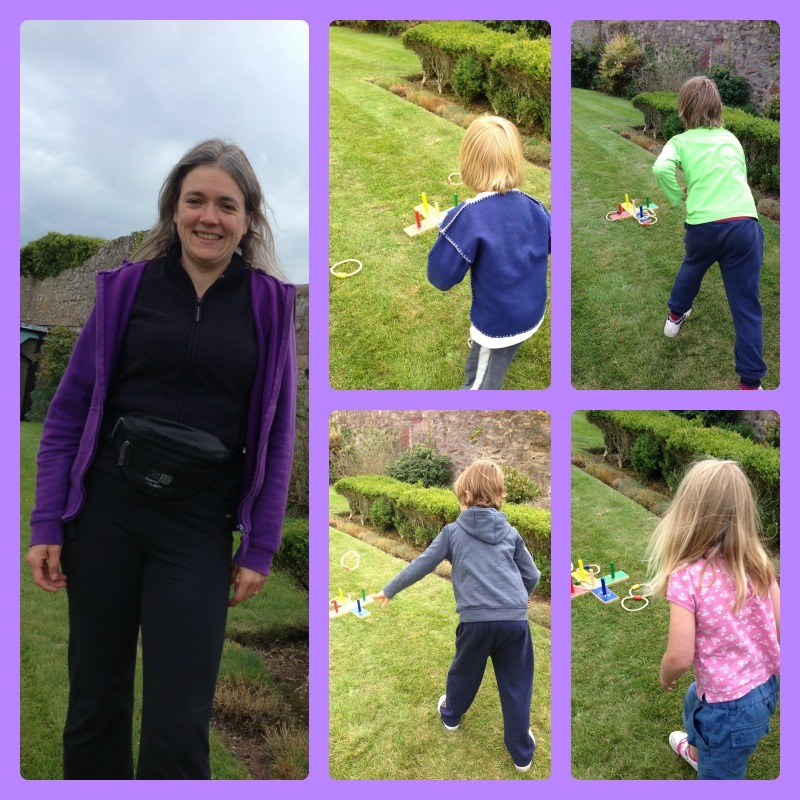 Then we played quoits, and Owl took a photo of me just to prove I’d been there! 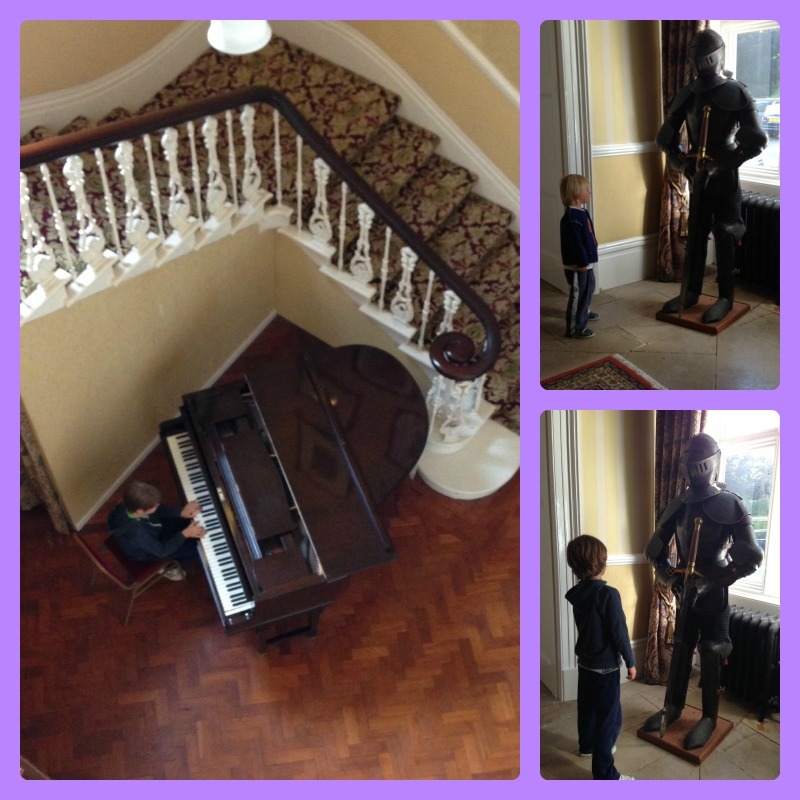 We went back inside – to the games room again – and Owl stopped on the way to play the piano. 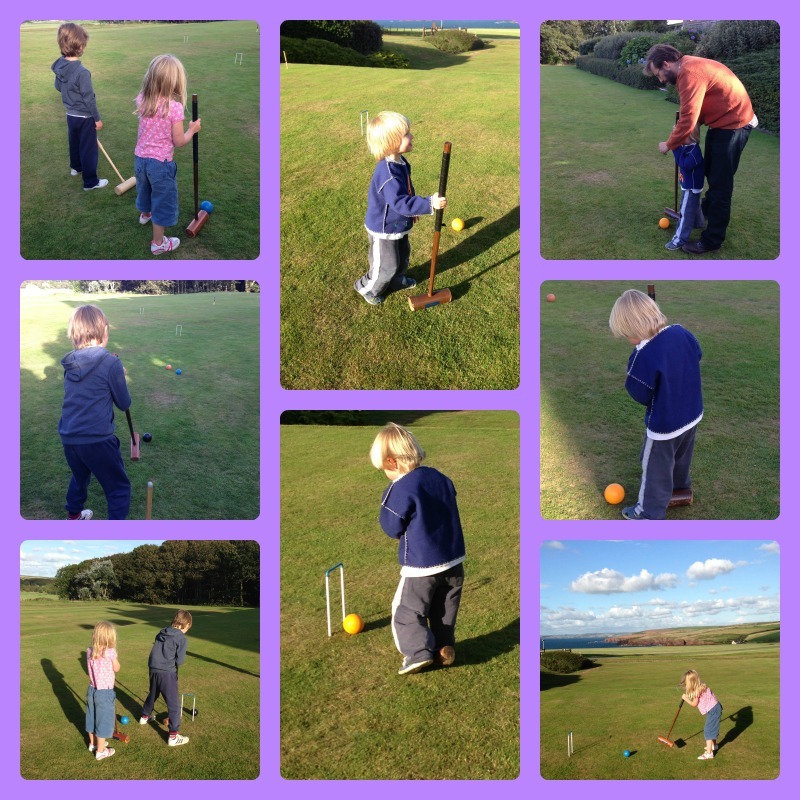 We went outside again to play croquet in the late afternoon sunshine on the lawn with a beautiful sea view – perfect! After another quick play in the games room we had some supper and then finished the evening with a very late and very long swimming session. We had the pool to ourselves for most of it, and it was lovely. And by the end of the evening, Monkey and Rabbit had both learnt to swim without armbands. Owl had also completed his self-imposed challenge of swimming ten lengths alternating front and back stroke, and Tiddler was totally confident about swimming on his own with armbands. 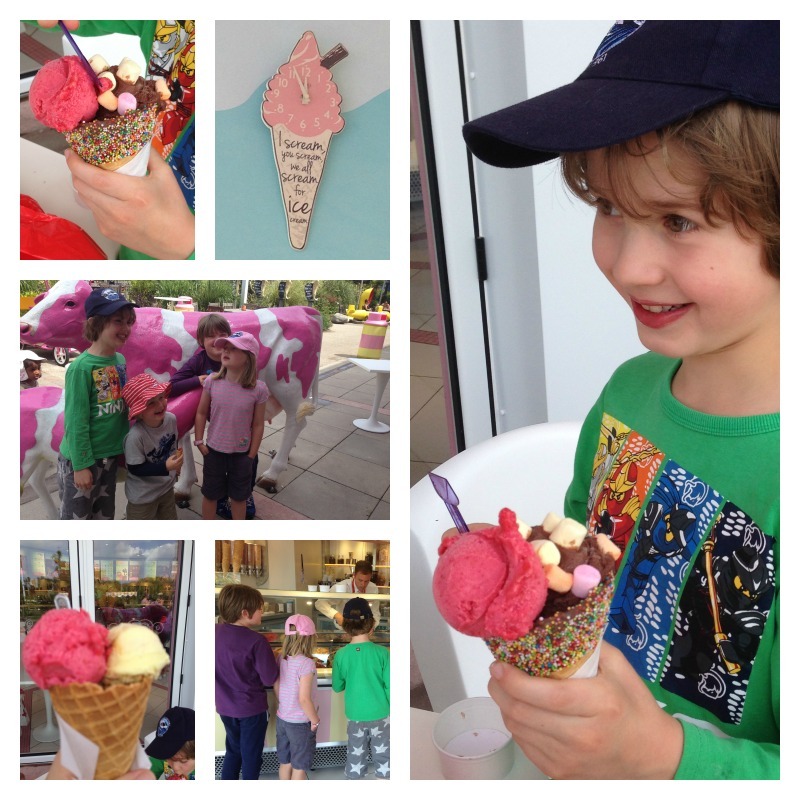 This was definitely one of the holiday highlights for me – a very proud Mummy moment! In the morning we had to pack up and leave our holiday house. The children were very helpful, and pushed several trolley loads of luggage to the car – as well as riding their beloved Trunkis of course. We weren’t in a hurry to leave, so we played tennis and then visited the play area, and of course the games room one last time. We finally set off when it was nearing lunch time because we wanted to get some of the driving out of the way before stopping. After lunch we visited some friends that we met at Spring Harvest last year, and then set off for Granny’s house. 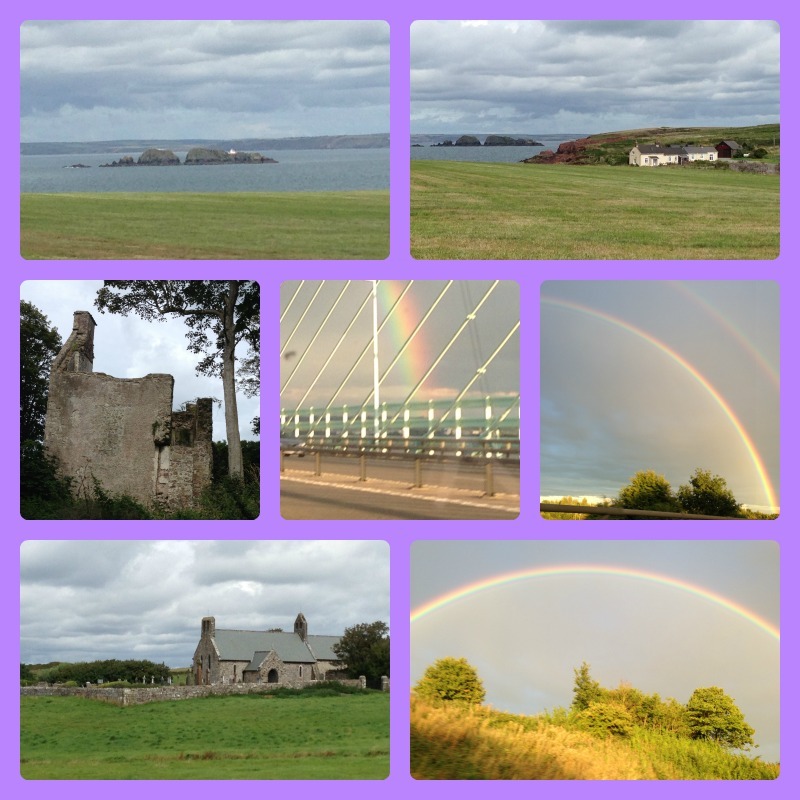 As we were leaving Wales there was a perfect double rainbow which seemed to sum up what had been a truly wonderful holiday. 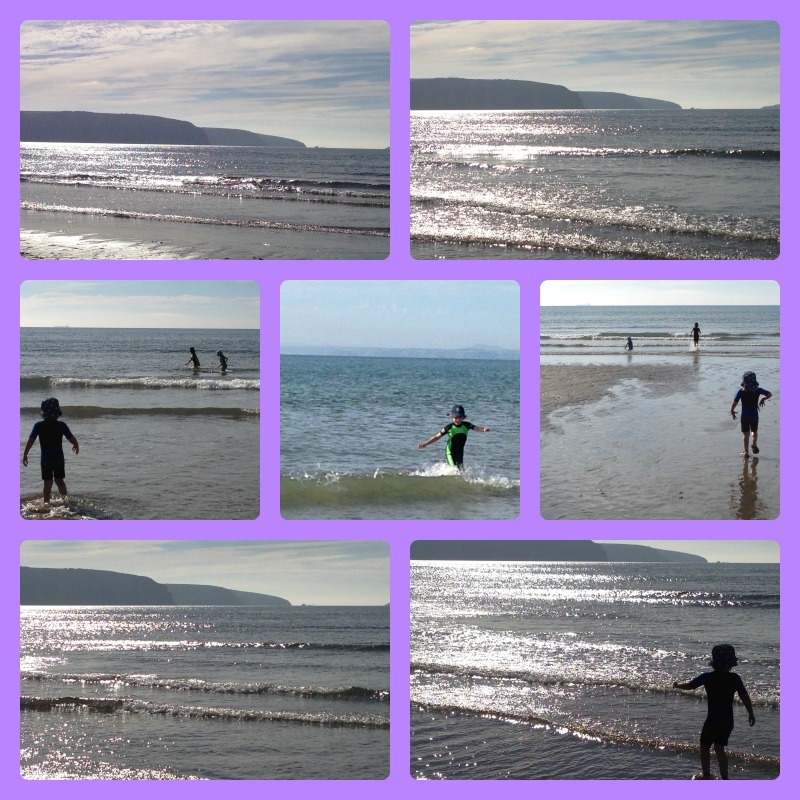 This entry was posted in Holidays and tagged Broadhaven beach, holiday, Pembroke Castle, Pembrokeshire, swimming, Wales on September 22, 2013 by Hannah. 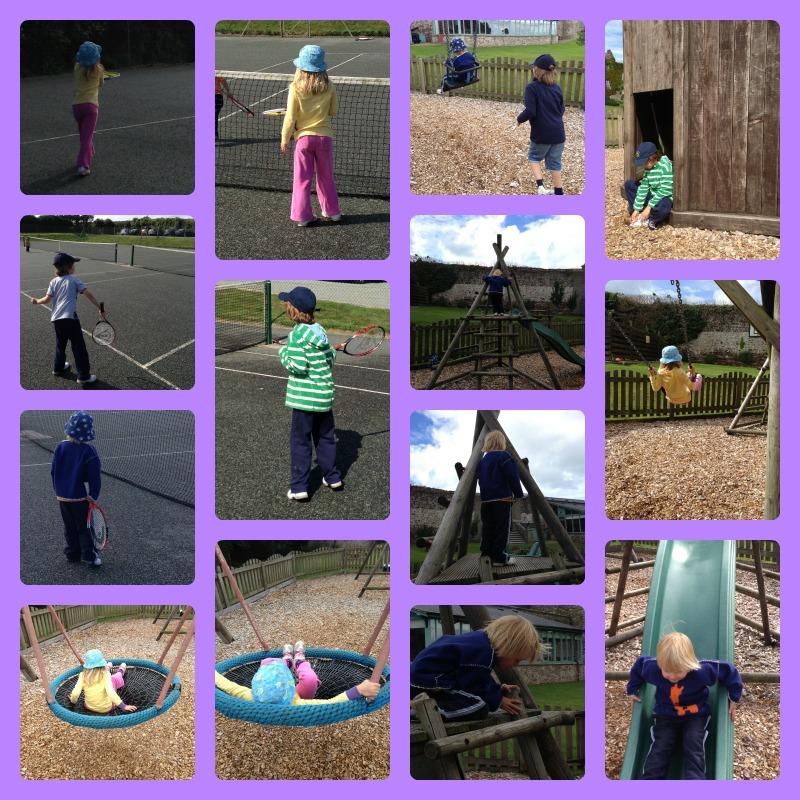 It seems a long time ago now, but we had quite a good half term, though it didn’t all go exactly as planned. On the first Saturday, Tiddler went to Dramabuds with daddy, and then I took him to Polesden Lacey while the big boys went to choir and Rabbit went to the Garden Centre with daddy. On Sunday after church, we spent the day doing housework and laundry and then set of to Granny and Grandpa’s house late in the afternoon. We were supposed to be staying for four nights but on the way we could smell diesel, so we called the AA out on the Monday morning. There was a fuel leak and it couldn’t be fixed there and then, so we arranged to be towed home on the Tuesday. On Tuesday, Rabbit, Tiddler, daddy and I went home in the AA tow truck, and Owl and Monkey stayed for two extra days with Granny. I made the most of the unexpected time at home and did a satisfying amount of stuff from the domestic to-do list. 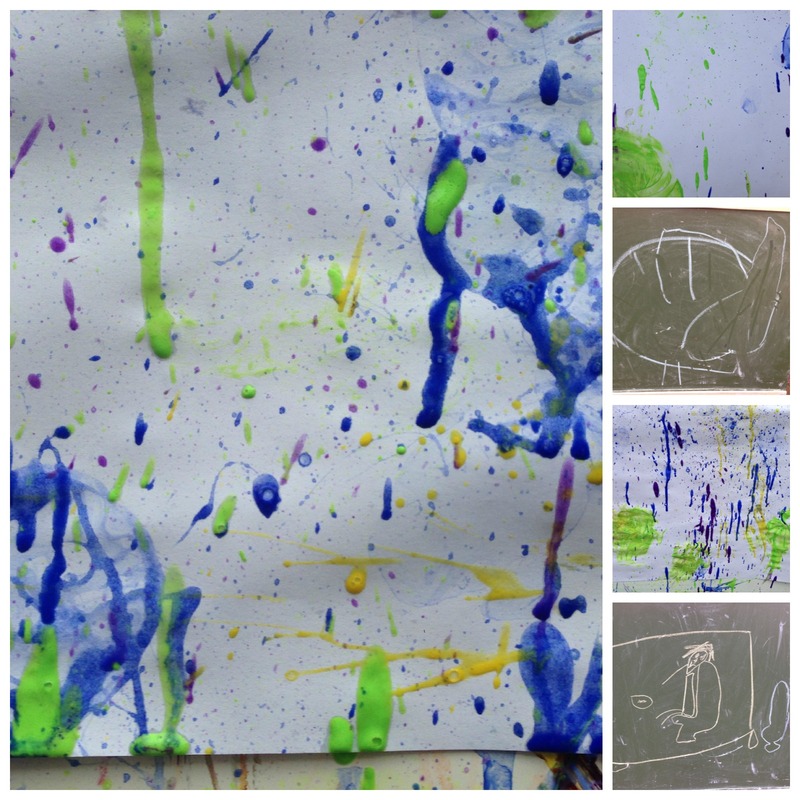 Rabbit and Tiddler did lots of drawing and making things, including collages, rockets and playdough people. 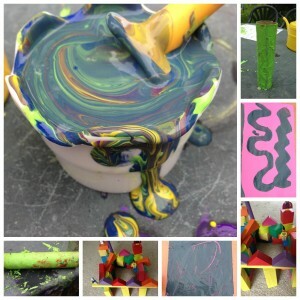 They also played with blocks, did some painting, including bubble painting, and drew pictures with chalk. 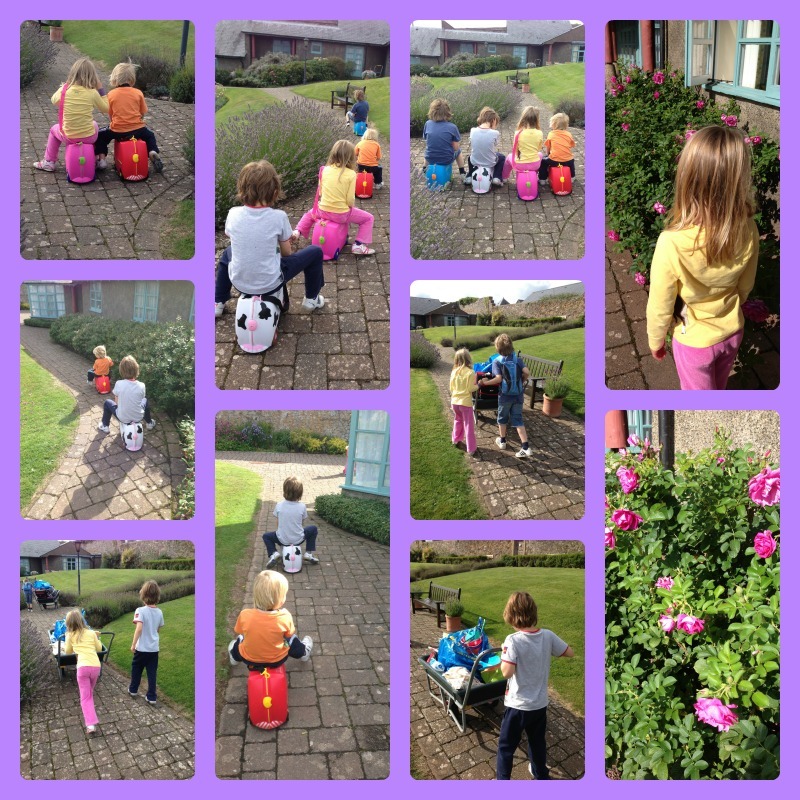 On Thursday, the big boys came home, and on Friday we had a lovely day in the garden. 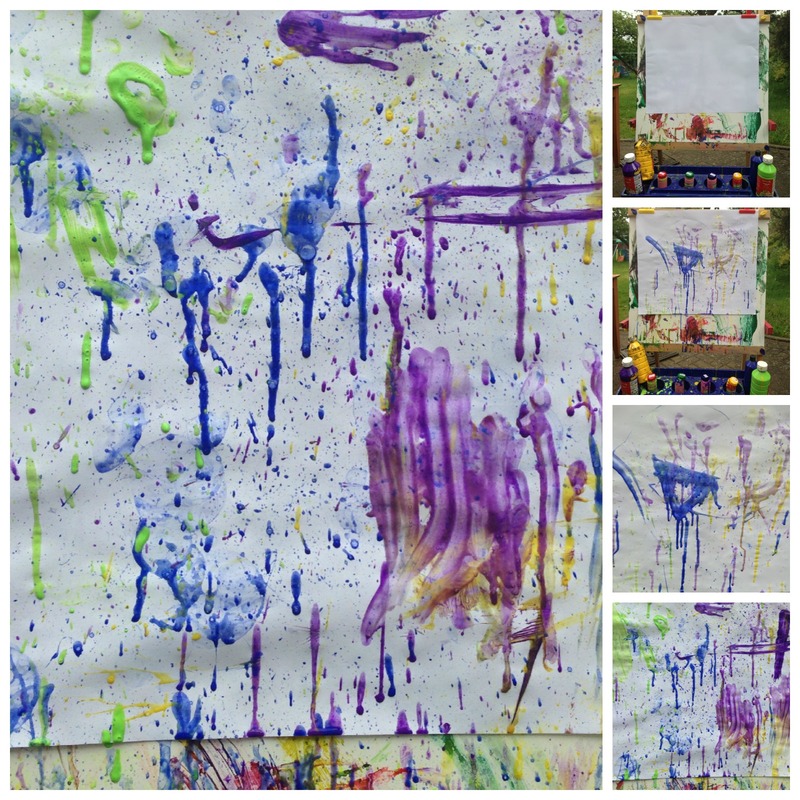 We did bubble painting again in the morning, and in the afternoon we had our story picnic. 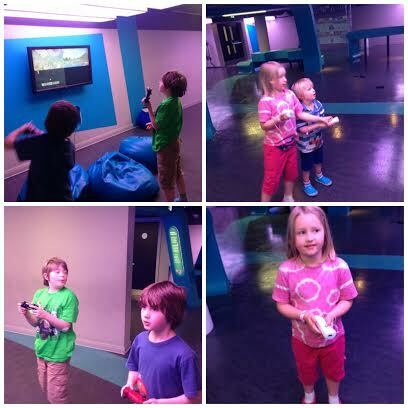 On Saturday, while I was at Cybher, the children went to the Science Museum with daddy. 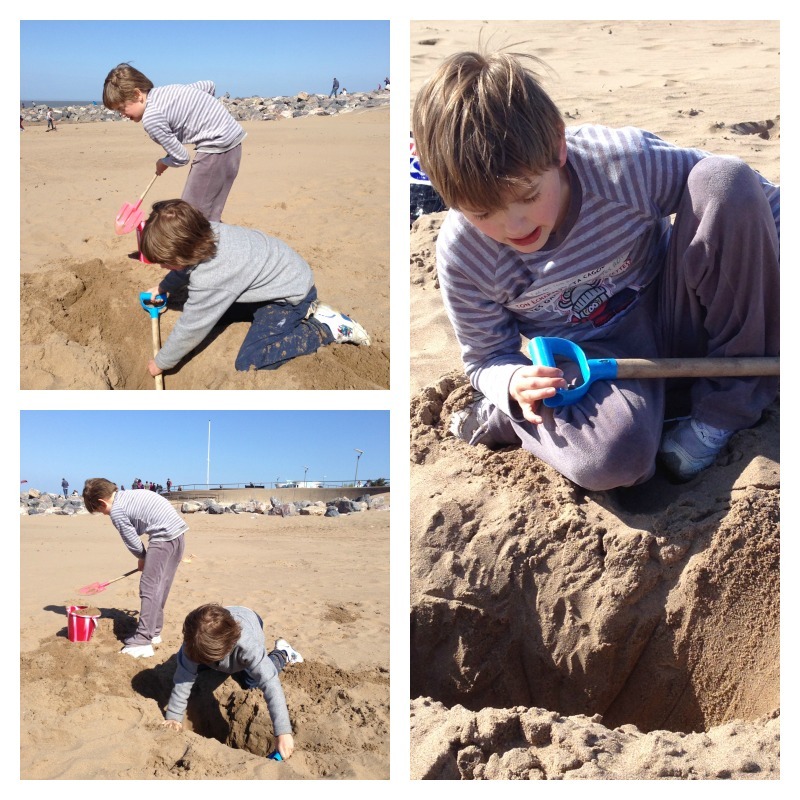 On Sunday we went to church and then spent the afternoon in the garden playing with sand and planting seeds. It was really relaxing and a good end to the week. This entry was posted in Holidays and tagged Birthday, half term, painting on June 6, 2013 by Hannah. On Bank Holiday Monday, we went to Morden Hall Park in the afternoon. It’s that time of year when I start to think we must visit some National Trust properties again, and it is our nearest one. After we had already planned to go there, we found out that there was a May Fayre on. 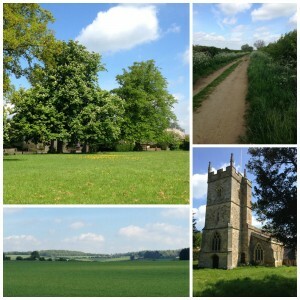 So instead of a walk in the park, which is beautiful – and free, it became a rather more expensive outing. It cost £15 for our family to get in, so I was hoping to avoid spending too much more money at the fayre. There were some really good free stalls with plenty for the children to do, but unfortunately there were also some very expensive fairground rides and attractions which inevitably distracted the children from the free stuff. 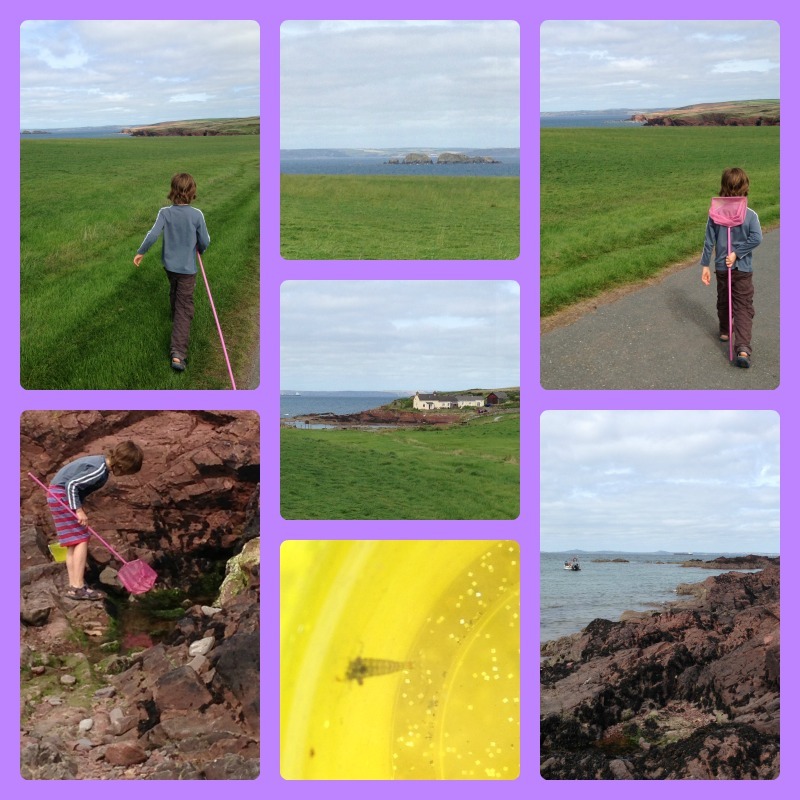 We started off in the National Trust area, where we picked up our 50 things to do booklets, and did our first two activities. One was to walk barefoot in the grass, which all the children did, and then they had to draw round one of their feet in the booklet. 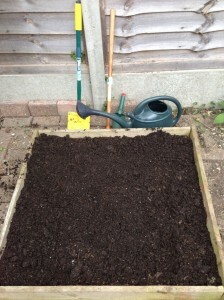 The second activity was to plant some seeds, which at this point only Rabbit wanted to do. She planted some radish seeds, and then we had to move on as the big boys were very keen to go on an enormous inflatable slide. It cost £3 for 5 minutes, and the big three all went on it. They all enjoyed it, but it was a very expensive 5 minutes. Tiddler was too young, so we paid £2.50 for him to go on a smaller inflatable slide, but he came straight off as it was a bit too scary. We couldn’t get our money back, but were offered a voucher for another ride. Next we went to look at an army camp which had been set up as it would have been in 1815, with people dressed up as soldiers from the period. It was really interesting to talk to them, and there were lots of other historical stalls around the fair which I would have loved to explore more. However, it was difficult to get the children to look at them, because they just wanted to do all the stuff that cost money. We met up with our friends from 3 kids and a gluestick, who had won an enormous cuddly dog on one of the fairground stalls. The children obviously thought it was wonderful, and wanted to do the same, but I didn’t want to spend money and risk winning something so big! We managed to distract them for a while by looking at some of the animals. I am not sure exactly which ones the children saw, but there were ferrets, dogs, chickens, rabbits, horses, Shetland ponies and goats. We then sat down in the shade (it was a very hot day) to watch the dog races in the main arena. After a few races, the children were called up to see if they could run as fast as the dogs. Owl had a go, and did quite well, but it really did show how fast dogs can run as even the biggest children couldn’t quite keep up with the smallest dogs. 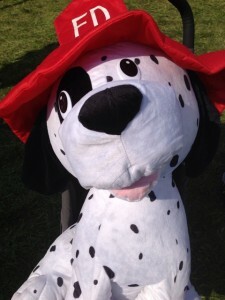 After that the children started to get quite grumpy as it was very hot, we had nearly finished our shared bottle of water, and all they wanted to do was go on the fairground rides but we didn’t want to spend another ten pounds or more. We thought we might have to leave, until we discovered a great stall raising money for Great Ormond Street hospital. They had Knex kits for sale, but also an amazing display of models including a huge rollercoaster. They also had a very simple game in which you paid a pound for a jar and there was money wrapped up inside which you could keep. We had several goes and won lots of 1p coins, but I didn’t mind spending the money on a good cause, it kept the children entertained and was in a nice shady area. We then found a small bouncy castle which Tiddler could go on with his voucher. He only went on for about 2 minutes, but he was quite happy. 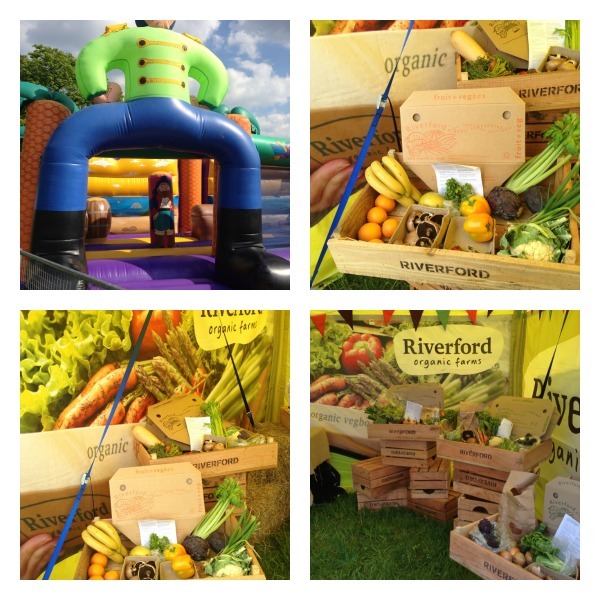 Next, we went into the Riverford tent to escape the heat and have a chat. We are huge fans of Riverford veg boxes and we always try to go and see them when they have stalls at local fairs. Next to the Riverford tent was a stall selling freshly squeezed lemonade, and I would rather spend money on that than on bottled water, so we bought two cups at £2 each. The children all really liked it, and daddy got very excited about the idea about buying a proper citrus juicer and setting up a stall at our church fair, outside our house and anywhere else he could think of. He has been happily occupied researching this idea all week so I’m expecting to see a business plan any time soon. Before we left, we headed back to the National Trust area because Rabbit’s compost and seeds had been spilt, and luckily she was just in time to plant some more. This time Owl and Monkey decided they would have a go, and planted some rocket and courgette seeds. 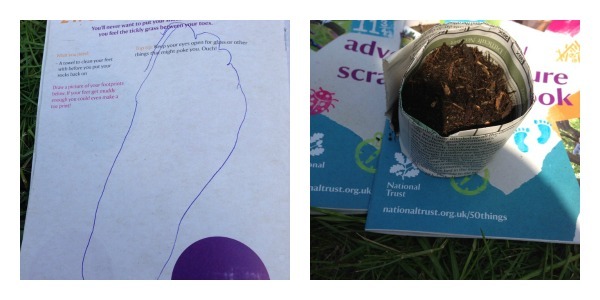 Owl and Rabbit also wrote and drew on paper leaves the things they liked most about Morden Hall Park. 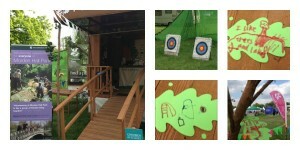 All four children also had a go at archery, which was right next to the National Trust area. It was quite expensive, but the kind of thing I don’t mind paying for. I know they really enjoy it so we try to do it whenever the opportunity arises, which isn’t very often. So although it had been a little difficult at times, we ended the afternoon on a high. It was by this time cool and pleasant, the crowds had diminished and it was hard to tear them away. We managed by telling them we would go and buy ice cream and cones at the Co-op on the way home, because the ice creams at the fair were £3 each. 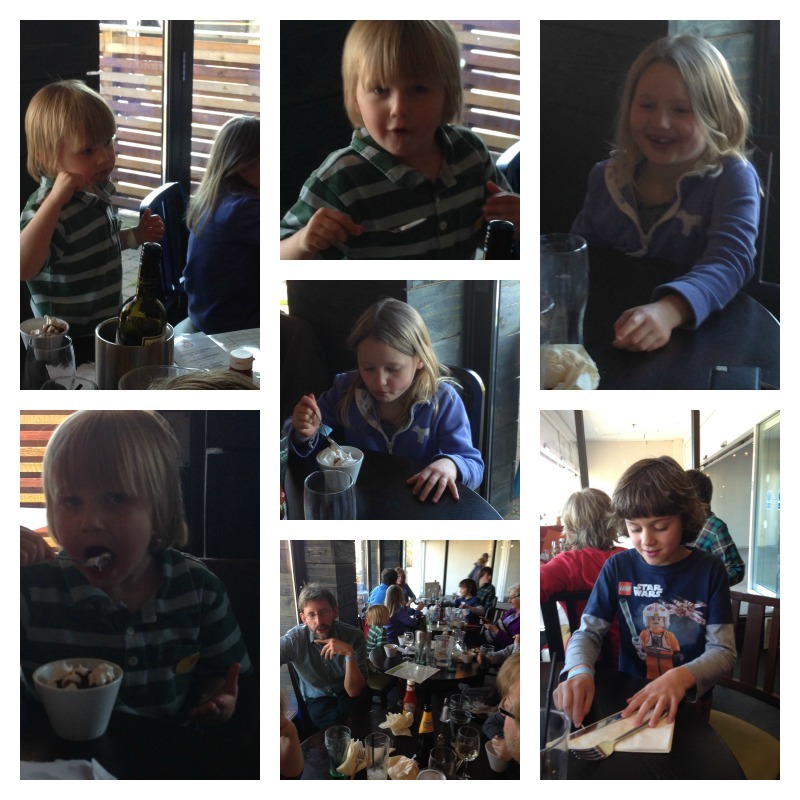 We spent less money and the children got two ice creams each instead of one, so they were happy! I love Morden Hall Park and we will definitely go back soon, but I think it will probably be even more fun on a normal day when we can explore more and spend less. 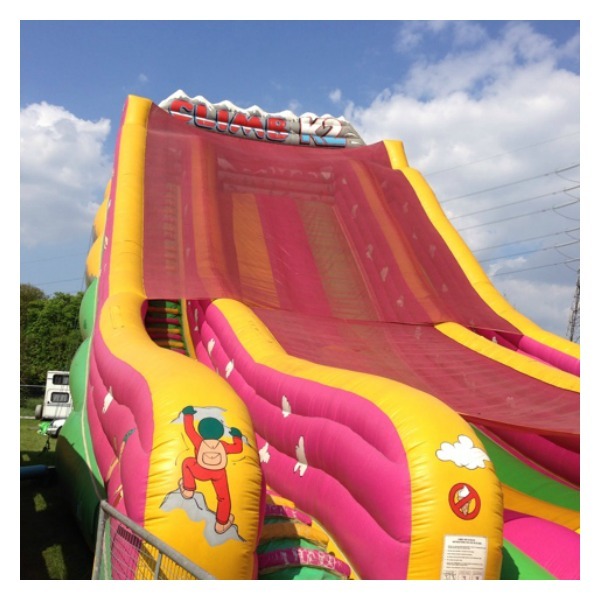 However, the children have of course asked to go back to the May Fayre next year! We probably will, but I will be warning them in advance about exactly what they can and can’t do. And if it is a hot day, I will take more water! It was a good event, with a lot of interesting stalls and activities, but it would be so much better without the fairground stuff. So how about it, lovely National Trust people? If you are reading this (and I will be tweeting you the link in a minute!) then please consider cutting out the commercial side of it and just leaving the good stuff in. If so, I would happily pay the £15 entrance fee, and have some money left to spend in the National Trust shop at the end of the day! This entry was posted in Holidays, Outings and tagged bank holiday, May Fayre, Morden Hall Park, National Trust on May 10, 2013 by Hannah. Last Friday, after a morning of violin lessons and Musicbox, we had a quiet afternoon at home, mostly spent in the garden. 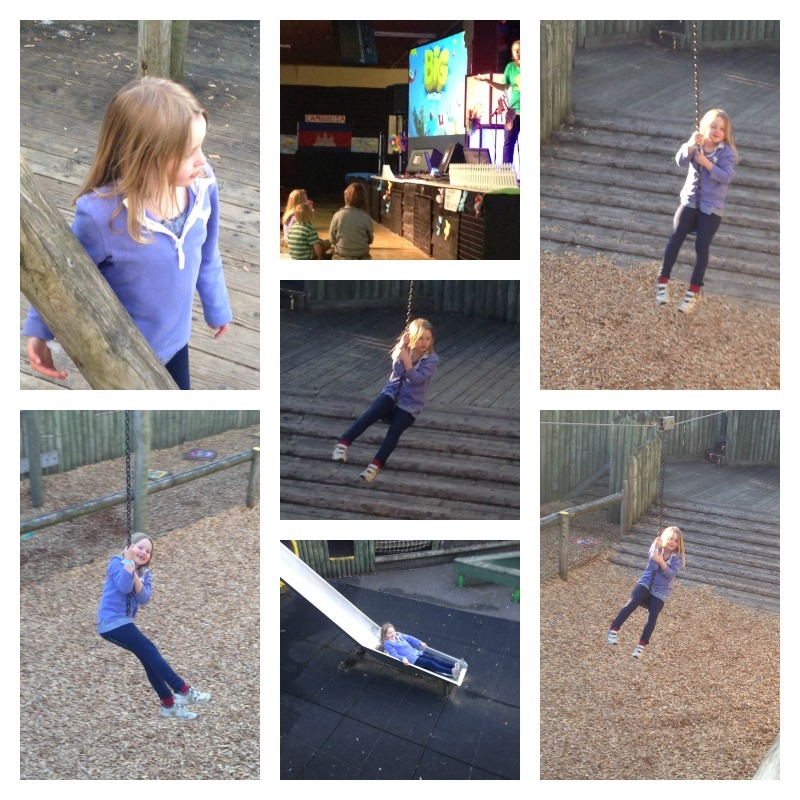 Rabbit wanted me to watch her doing “gymnastics” on the climbing frame, and we had a lovely time together while the boys were otherwise occupied. Then Tiddler came and joined in and they played together for a while. I really enjoyed spending time with them outside, making the most of the sunshine (which has since disappeared) and the garden (which is a bit of a mess but has some nice bits). 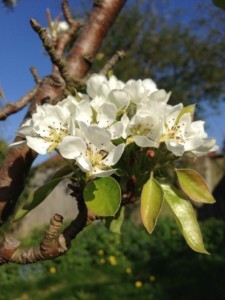 There is blossom on the pear tree. There may or may not be pears. Probably not, but for now it is doing a good job of making the garden look better. There is also blossom on both the apple trees (much bigger and more established than the pear tree) and they look amazing, but I haven’t photographed them yet. After climbing and hanging from monkey bars for a while, the little ones wanted me to push them on the swings so we did that for a while, and then we decided to dig and weed the vegetable patch. 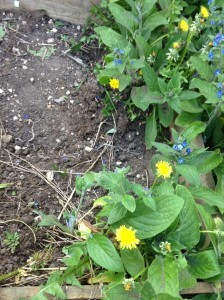 This is a very small raised bed which has been abandoned since last summer, and it was completely overgrown with weeds. I should have taken a proper “before” picture but it didn’t occur to me until about half way through. 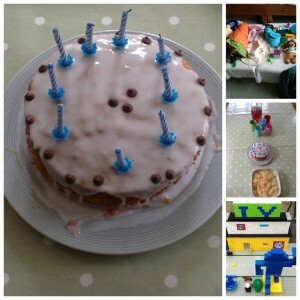 Anyway, after about 45 minutes of really hard work by me and Rabbit (and some “help” from Tiddler) it looked like this. We carried on for another 45 minutes, and more or less cleared it but hadn’t got all the roots out when we had to abandon the project because daddy had arrived with pizza for supper. 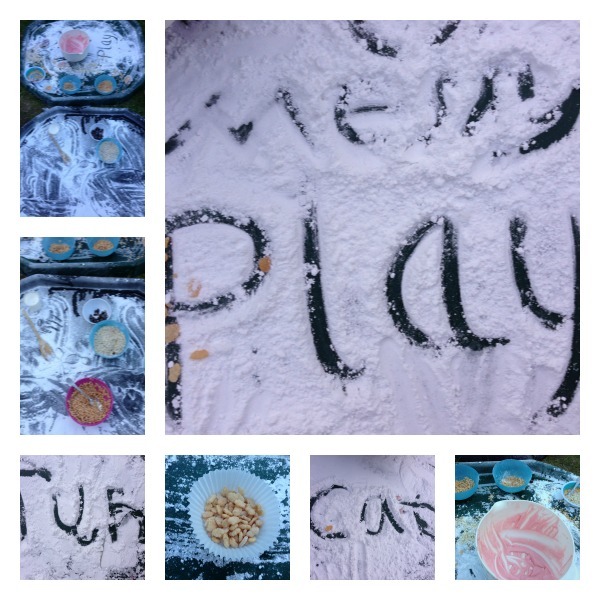 The children asked for angel delight for pudding, and of course it had to be in the Tuff Spot so we had an impromptu messy play session. I made some strawberry angel delight and quickly found a few other things for them to play with/ eat: oats, rice pops, raisins and icing sugar. They had a wonderful messy time, while we sat in the garden drinking wine and getting in the bank holiday mood. 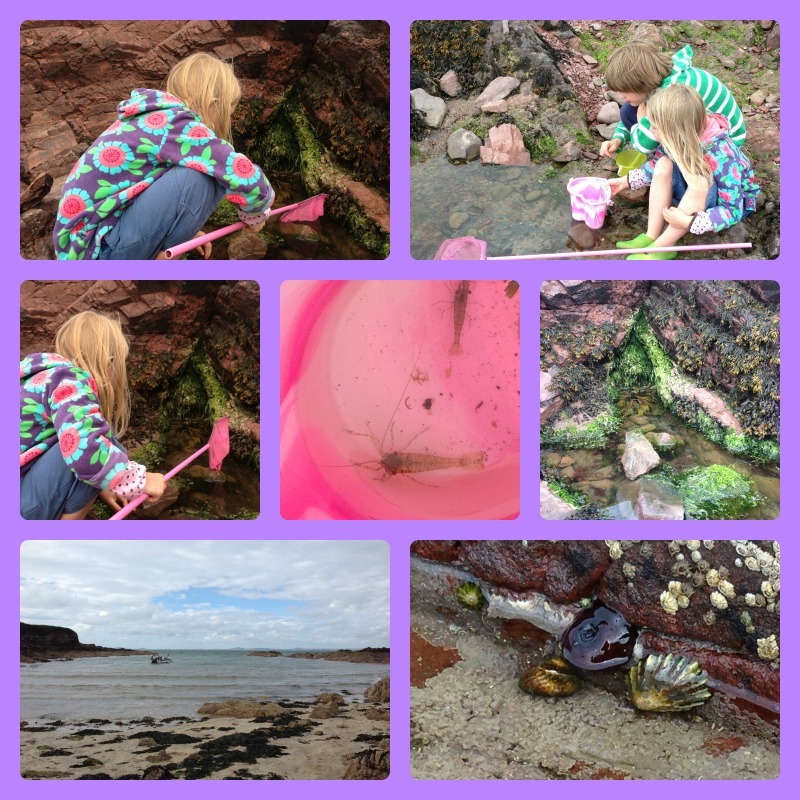 Saturday was mostly spent on children’s activities (dramabuds, choir and playing at home), housework, more digging and weeding, and also sorting out some of our clutter which has been sitting in a life-laundry style tent in our garden for ages. We decided that bank holiday weekend was a good time to deal with it properly, as we’d had enough of looking at the tent taking up space in the garden. On Sunday, daddy took the children to church while I did yet more housework, and we did another stint of clutter sorting after lunch. 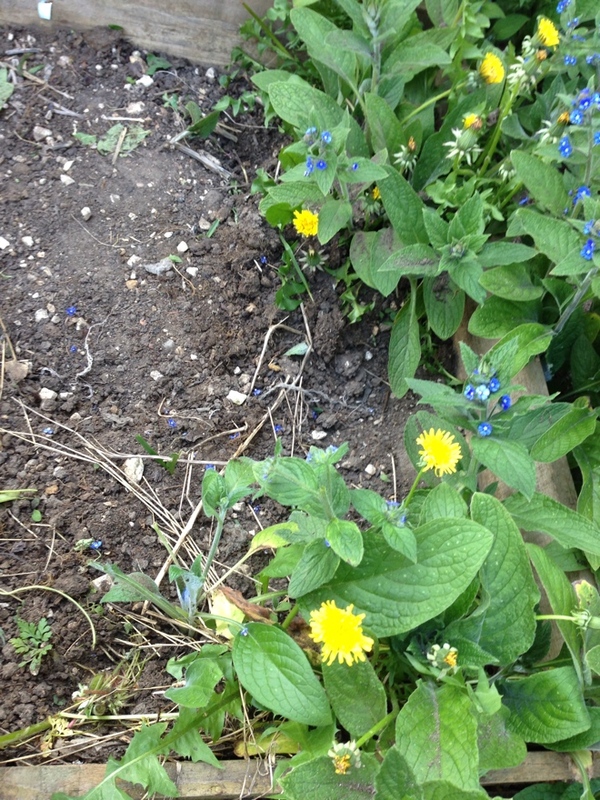 Rabbit, Tiddler and I planted some pumpkin seeds in the vegetable patch. So this is our “after” photo for now, though I hope to be able to add photos of pumpkins growing in due course! We then went round to Granny’s house, where our friends from 3 kids and a gluestick joined us. 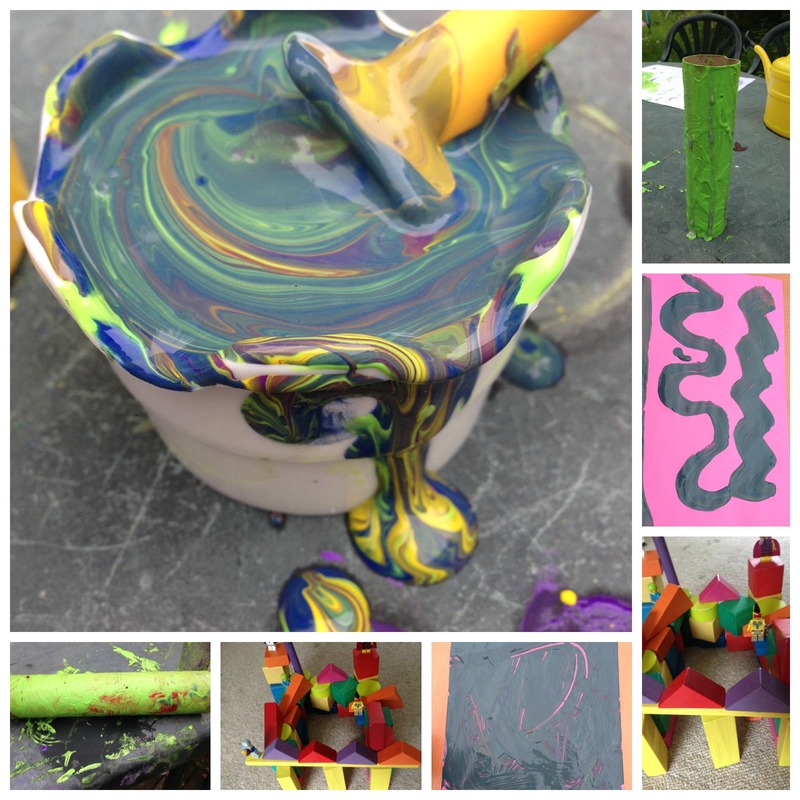 The children played, the mummies supervised, and the daddies attempted to sort out tools, clutter and cars(!) in Granny’s garage. I think the sorting was only moderately productive, but the children had a lovely time and we had the first barbecue of the season. On Monday, we had planned to go to Morden Hall Park, but I decided we couldn’t go until the tent was down, as I was starting to think it would become a permanent fixture in our garden. So we had a final push and sorted out the rest of the stuff, setting aside some to give away or sell, returning a few useful items to the house, and making a satisfyingly huge pile of stuff to go to the dump. 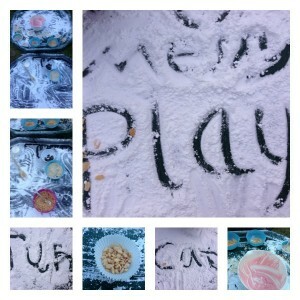 Once we had done this, it was lunch time, so we abandoned our picnic plans and had lunch in the garden. Three glasses of wine later (in my case as I was not driving), we did actually manage to get the children rounded up and out to Morden Hall. I will blog this separately, as I am going to try and make the most of our National Trust membership this year, and write individual blog posts about each place that we visit. We have signed up to the 50 things campaign which has just been relaunched, and I am determined to do more with it than we did last year. 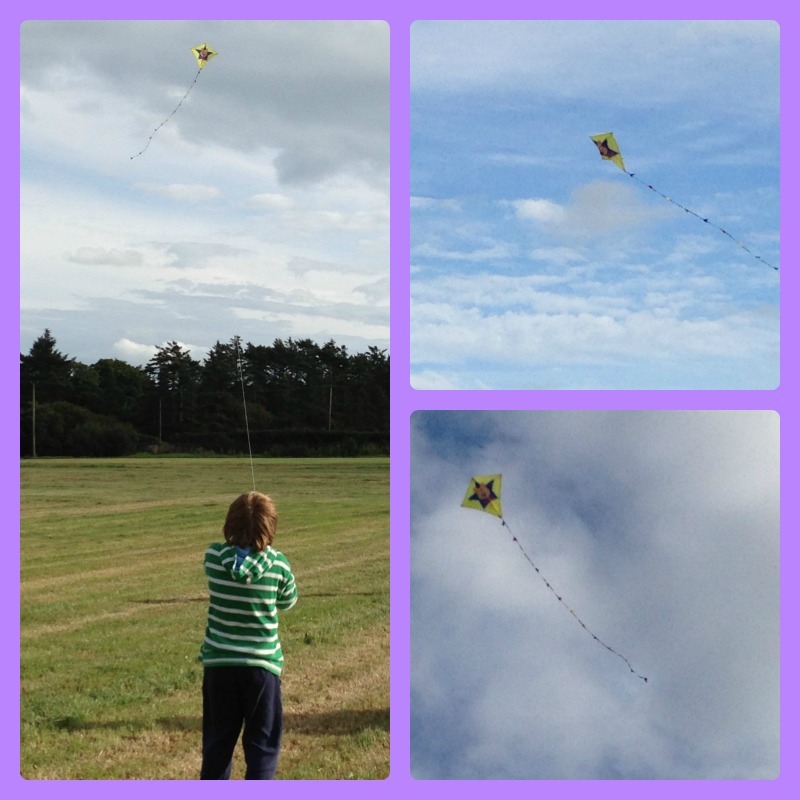 So that was our Bank Holiday, busy and productive, but also fun, though not exactly restful. I feel like I need a holiday to recover! 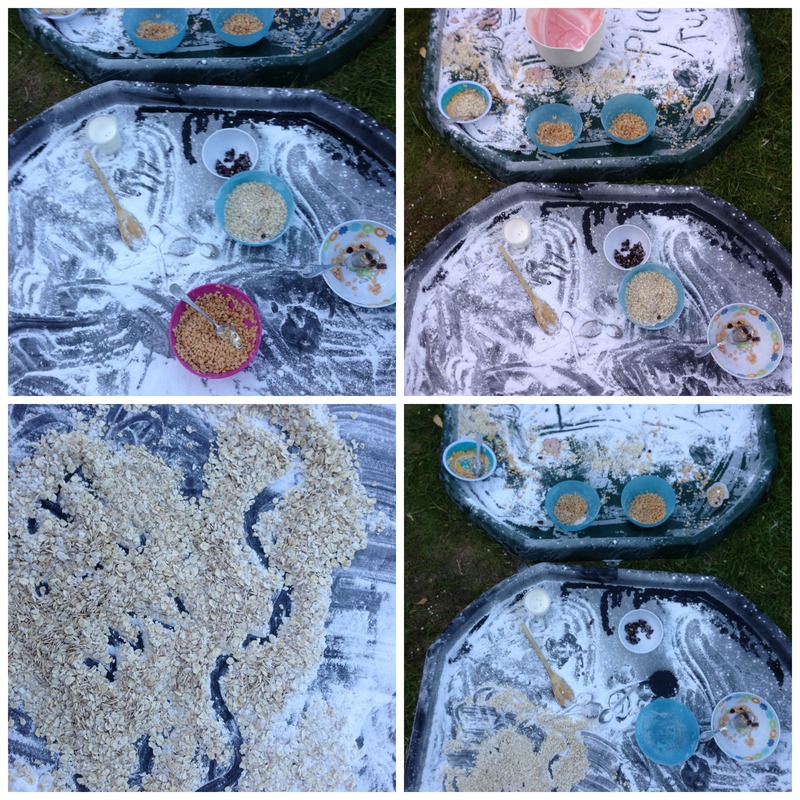 This entry was posted in Holidays, Playing and tagged bank holiday, barbecue, garden, gardening, messy play, Morden Hall Park on May 9, 2013 by Hannah.